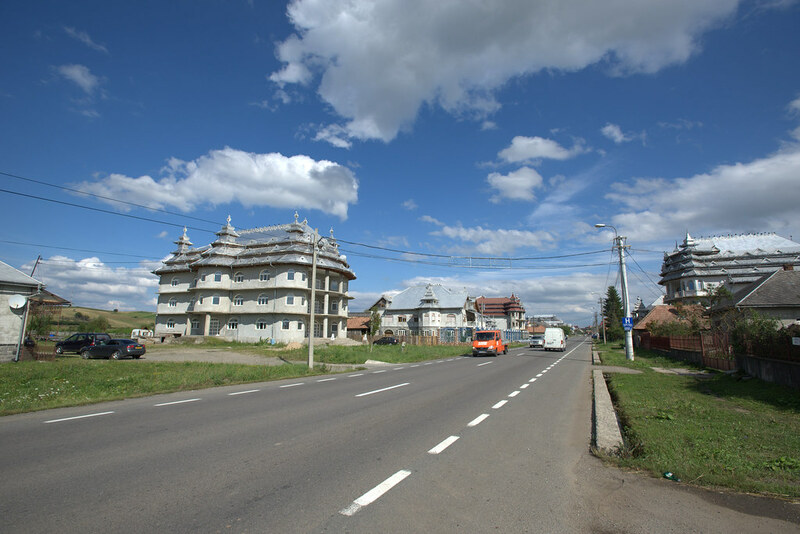 Our introduction to Romania wasn’t the best one, we crossed the border late due to bad planning and the road to Oradea was a busy, horrible one with industrial parks on either side so we were unable to find anywhere to camp. We arrived into the city tired, sweaty and very hungry and so succumbed and decided to eat out at a restaurant which is never good for the budget! 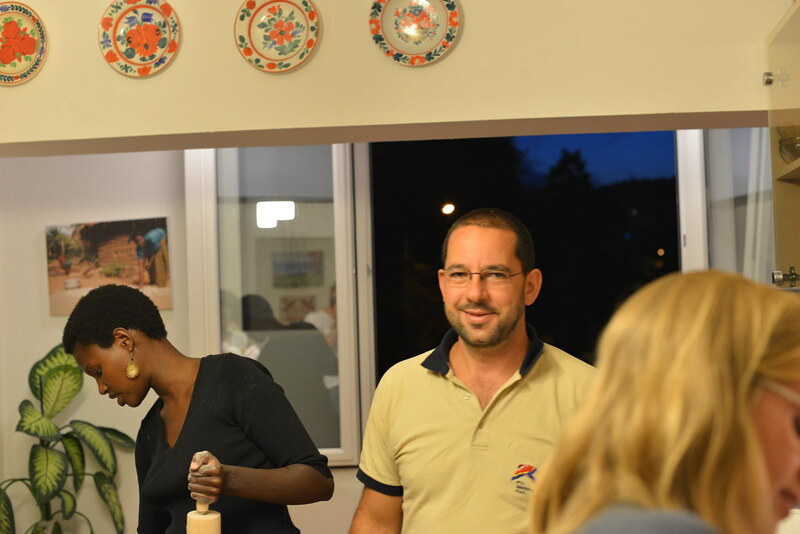 The food was delicious though and we enjoyed our first taste of Romanian cuisine, which turned out to be pretty similar to Hungarian food! As we were eating we were also desperately emailing Warm Showers and Couchsurfing people hoping for a miracle and that someone would agree to host us at such very short notice. 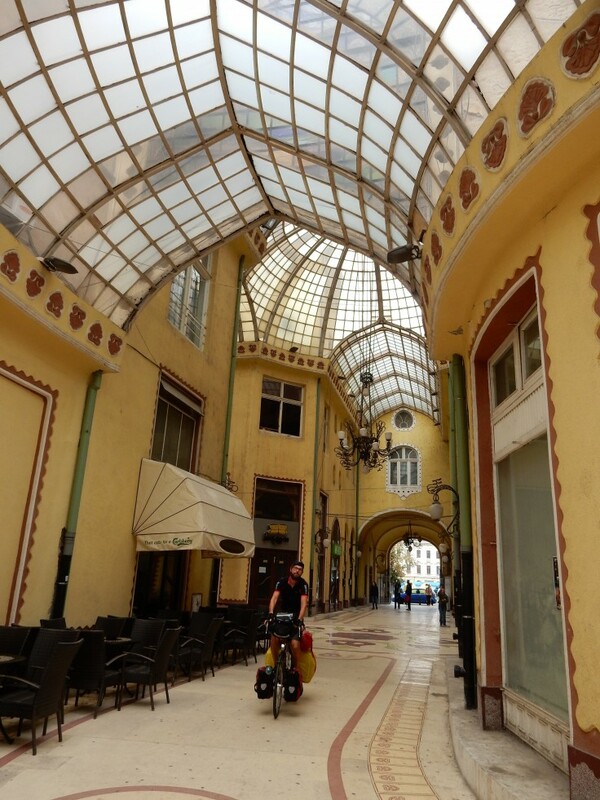 And it was testament to the Romanian people and a sign of things to come that between ordering our food and finishing up dinner, three people got back to us and offered to let us stay! 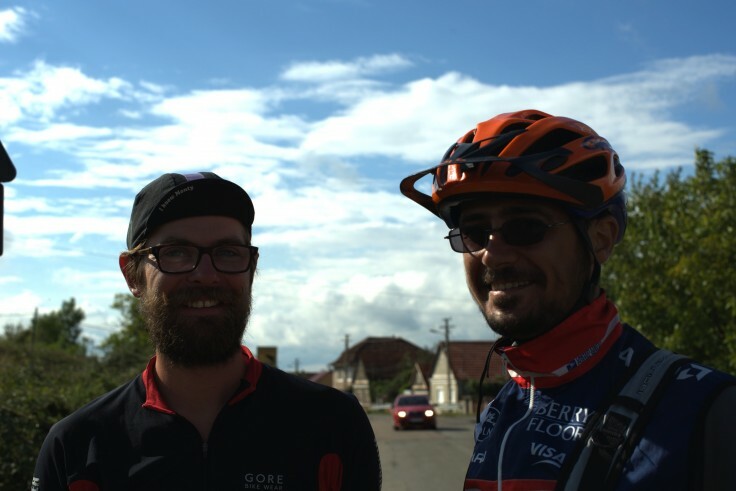 We ended up staying with a lovely guy called Adrian who took us on a tour of Oradea the next day and cycled with us into the Romanian countryside to show us the best way to our next destination. 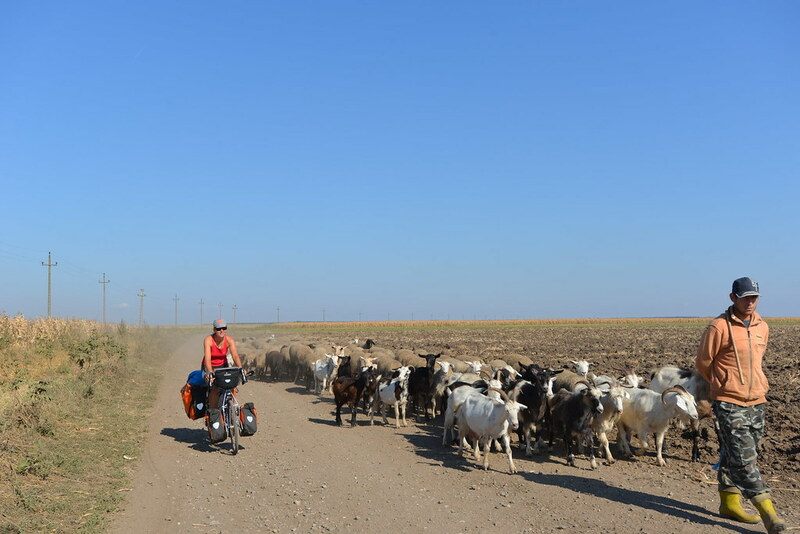 The Romanian countryside was very beautiful and looked different to the other countries we have cycled through, it was certainly a lot hiller than the Hungarian plains we just left. One thing we did notice already was that there seemed to be a lot of stray dogs around which made us nervous. 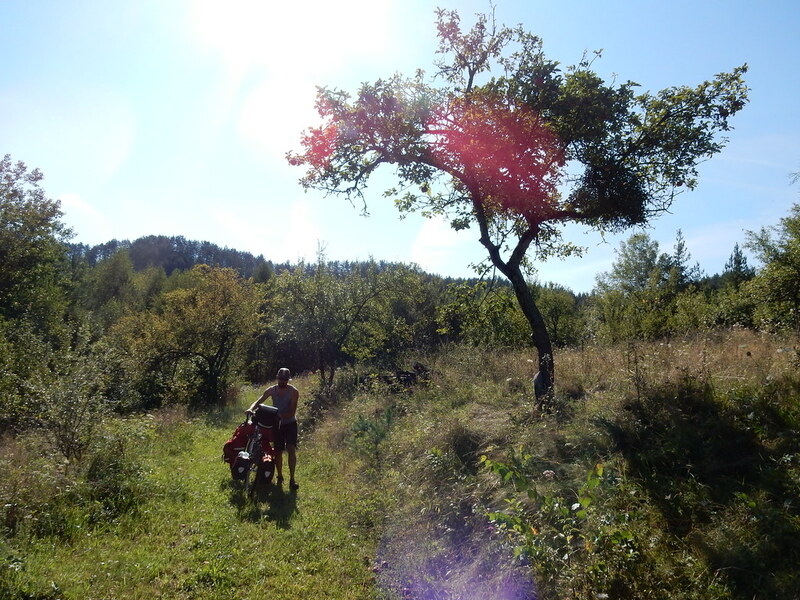 We tried to find a campsite that Adrian recommended in a village nestled amongst the hills but it seemed to be shut when we arrived so we camped in a little orchard and one of the stray dogs seemed to adopt us, he followed us everywhere and even protected us from other dogs that started to bark at us. He lay near the tent all night and stayed outside till well into the night, we named him Whitey! 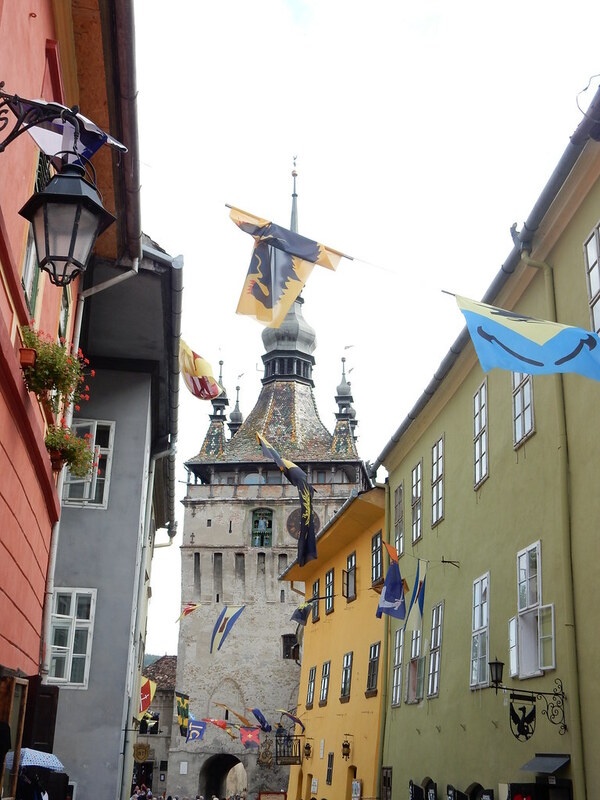 Our intended early morning start didn’t go very well as we overslept and then also realised that Romania is the beginning of a new timezone, so it was even later! 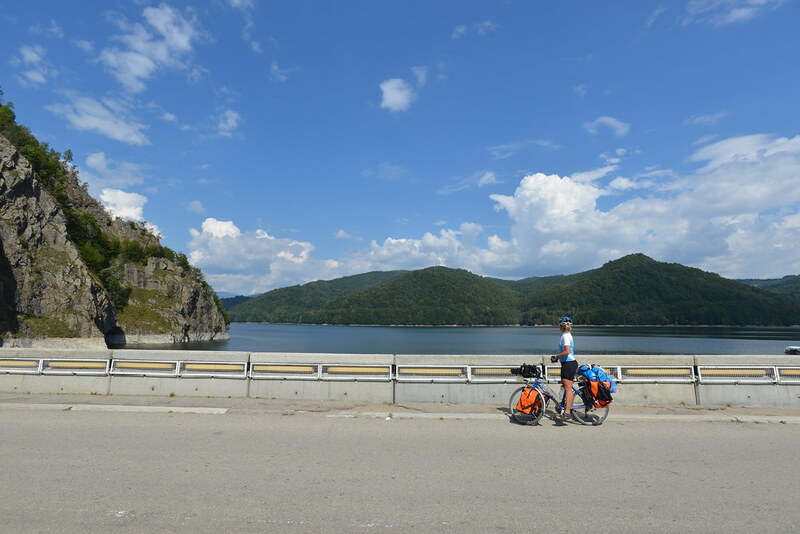 However, once we did get going the ride was incredible, it felt like the set from a film, with rolling hills, cliff faces, a beautiful river which the road followed for a while and interesting little Romanian villages. 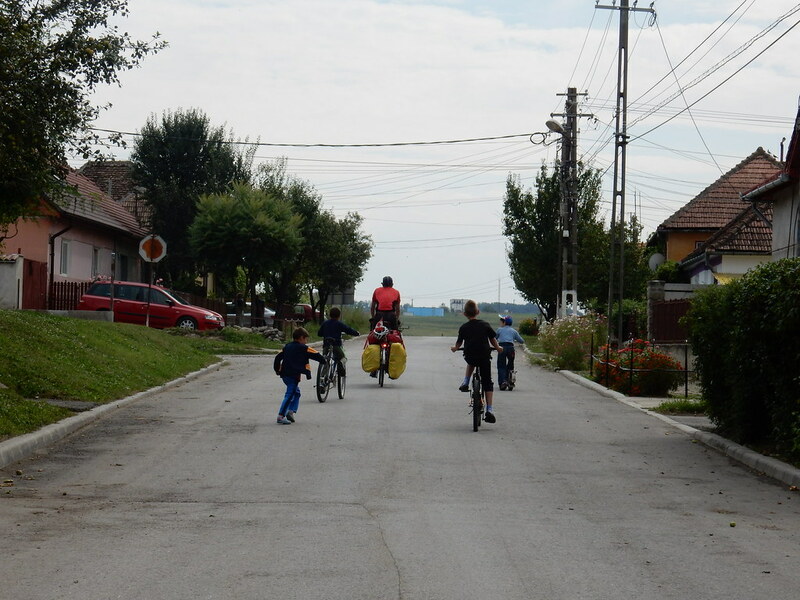 We also got lots of waves, friendly car beeps and generally lots of good cheer from the Romanians that we encountered. In the afternoon an ice-cream van man even stopped and gave us an ice cream each – which was really kind! 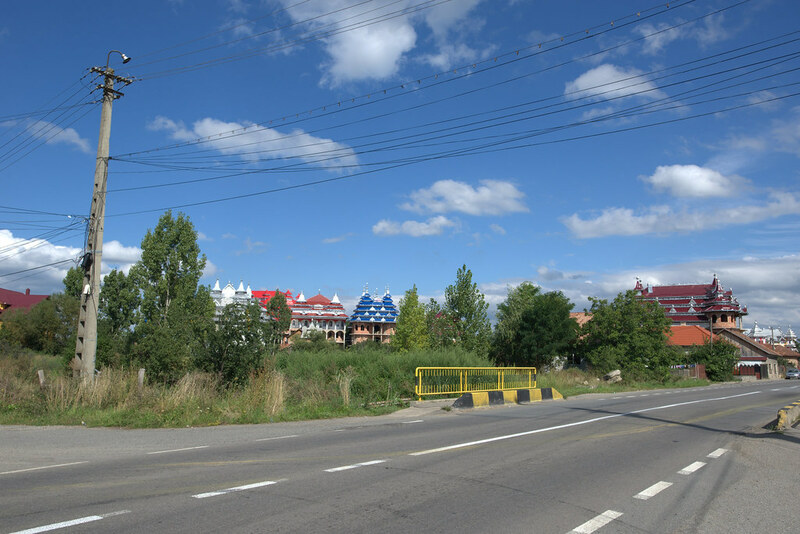 One of the cities we cycled through in the afternoon was a place called Huedin and it was one of the strangest places we had seen so far. On the outskirts of the city were masses of enormous mansions that were in various states of completion, most of them had colourful, garish and very elaborate roofs that seemed to be a little bit styled on the roofs you might find on an Asian temple but a very tacky version, but no windows or doors! 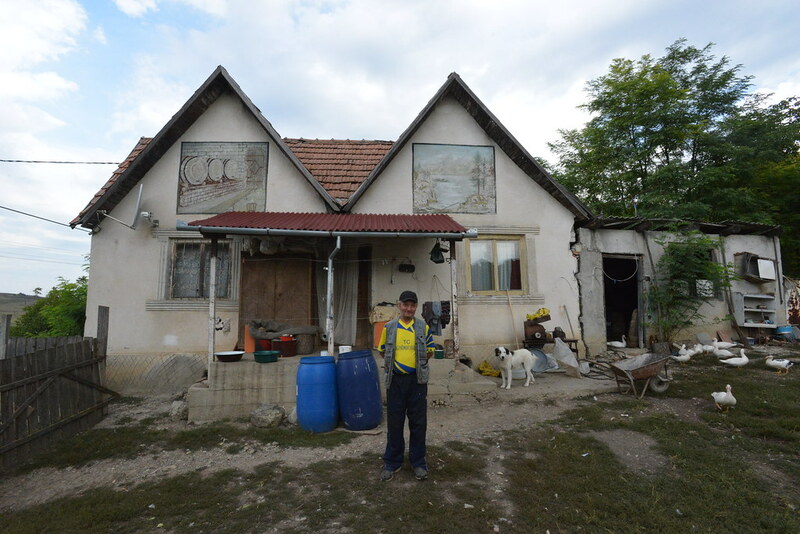 We later found out they are gypsy mansions and most Romanian people think they are awful too. We also discovered that the British press have written many articles about how they are funded by a gypsy mafia of beggars and thieves that operate in England and all over Western Europe, however how much of this is true I have no idea! 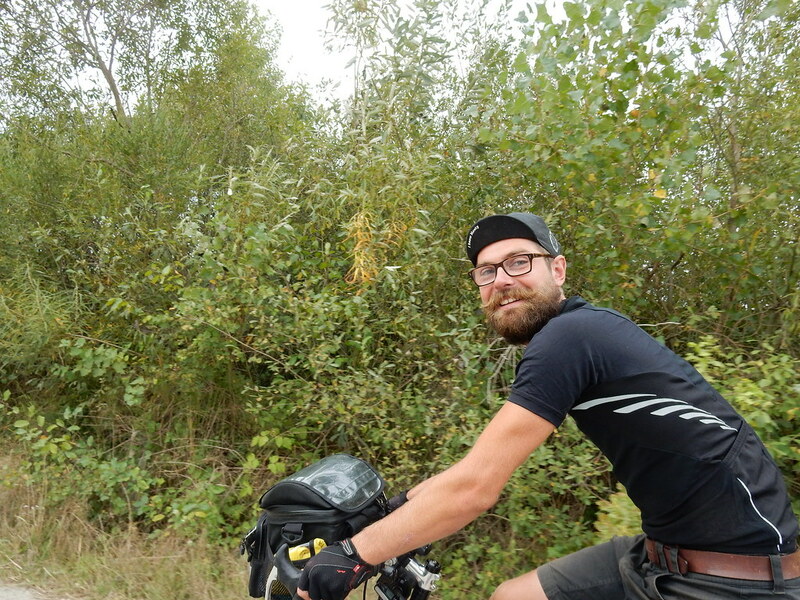 We were trying to get to a cabin on the lake owned by a Warm Showers host called Stefan and by the time we reached the lake area we had cycled a very long way, it was late and all the way to the cabin was uphill it seemed! 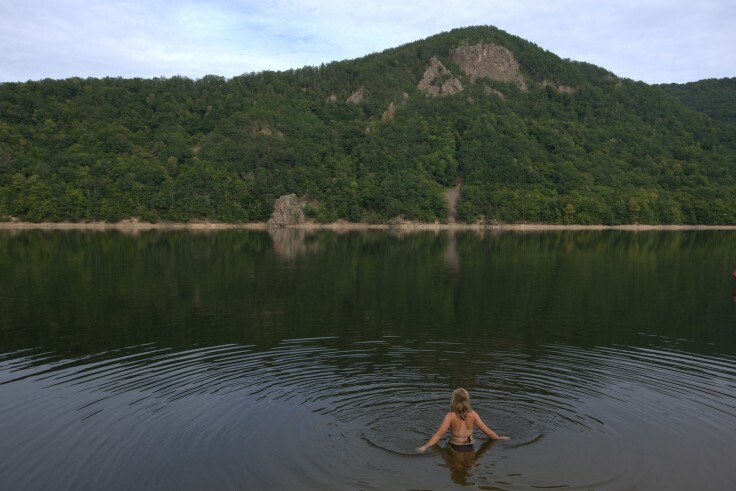 The area was very beautiful with forests surrounding the series of man-made lakes that were created when a series of dams were built in the ‘70s. Riding across the dams was awesome and the views were spectacular, shame I was feeling almost too tired to appreciate it! 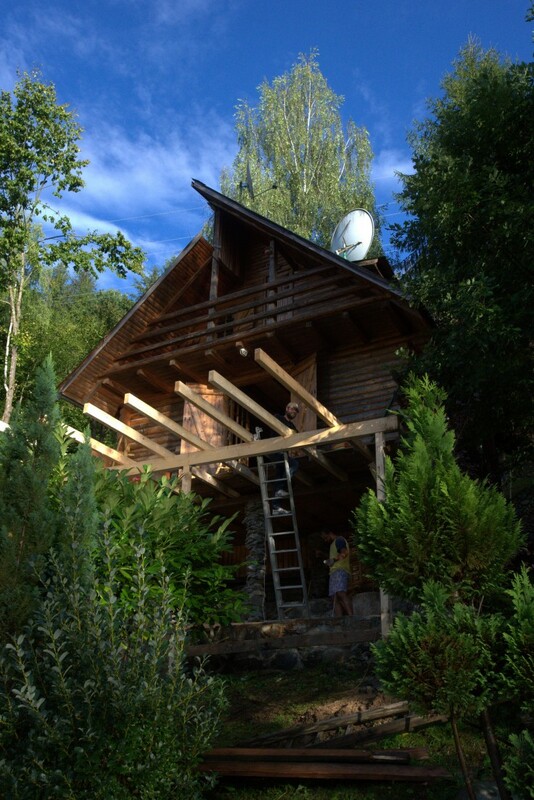 We had a lot of trouble finding the cabin and when we finally did arrive we discovered that Stefan was not there due to our shifting schedule and lack of internet access, so we had to camp outside! A (fairly) early morning dip in the lake was a great way to start the day and as we were drying off, Stefan, his wife Deanne and their two beautiful little daughters Jessica (just over 1 year old) and Vanessa (only two months old) arrived and with them they brought breakfast!! We spent the day resting, relaxing and getting to know Stefan, Deanne and the girls. Deanne is from Burundi which we were really intrigued by as neither of us know much about that part of the world and were eager to learn, however, I am sure we were probably pretty irritating with our constant questions! We ended up spending a few days at the cottage and during that time we ate lots of delicious food, salads, barbecue, baba ghanoush, Deanne and Stefan are very good cooks! 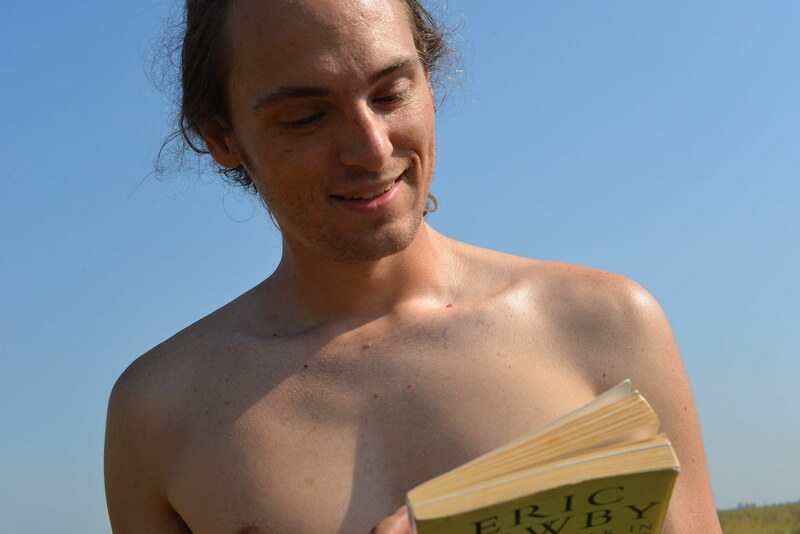 We also swam in the lake a lot which felt great and in André’s own words ‘he was really manly and was building stuff’. 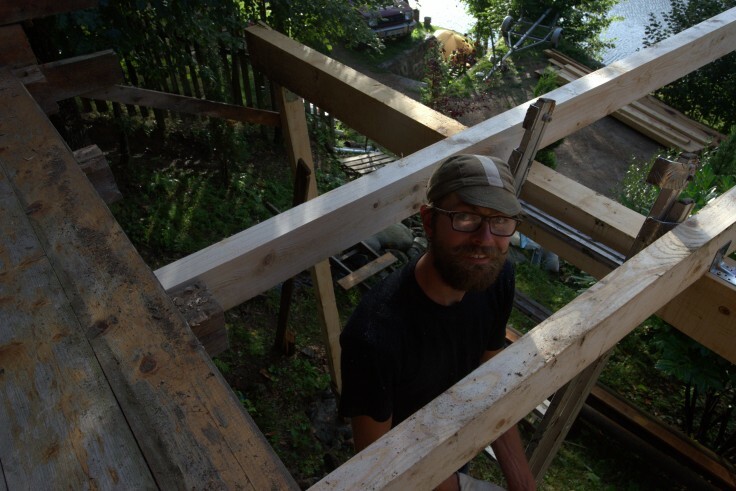 Stefan and André built a veranda in a couple of days which was pretty impressive! 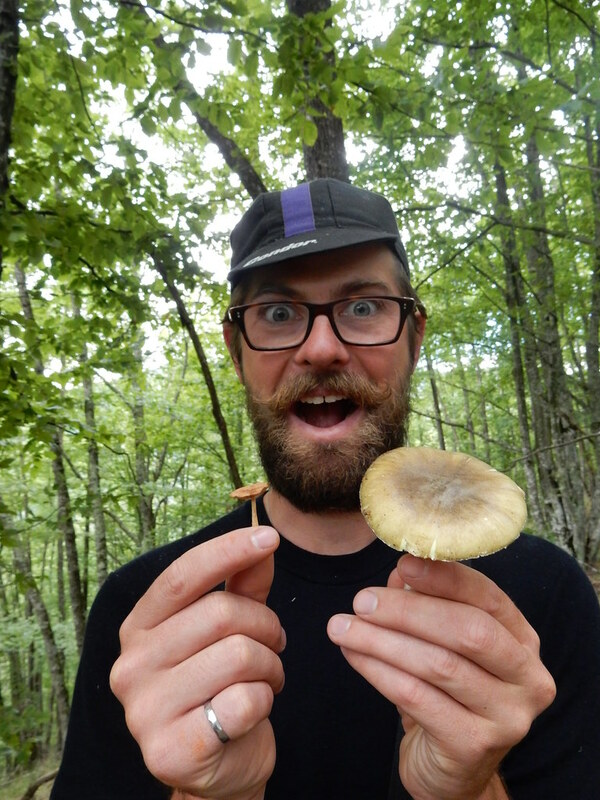 We also spent an afternoon mushroom picking, which was really exciting! 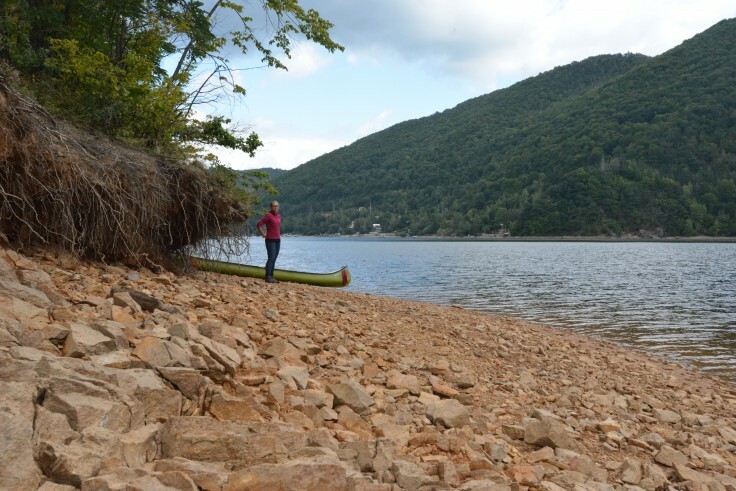 We canoed across the lake to the more deserted side and then trekked through the woods to the top of the hill. 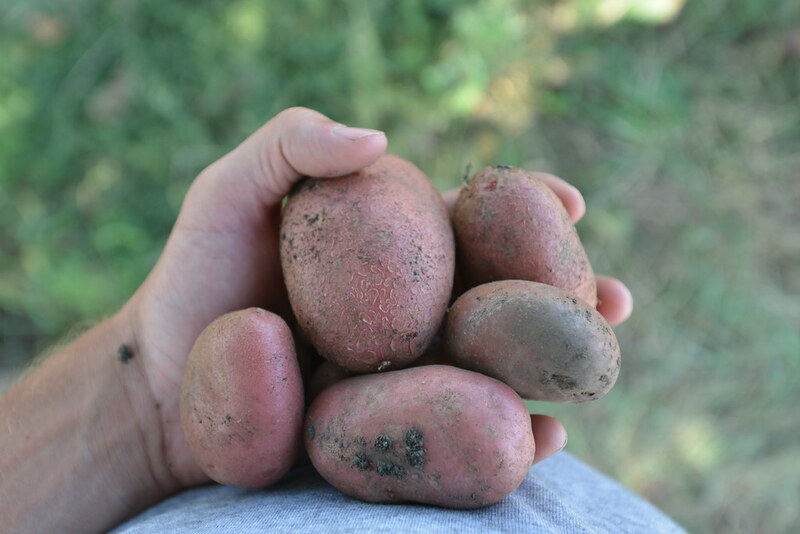 We picked everything that we found, figuring we could just check with Stefan later if what we picked was edible, and we picked a lot. 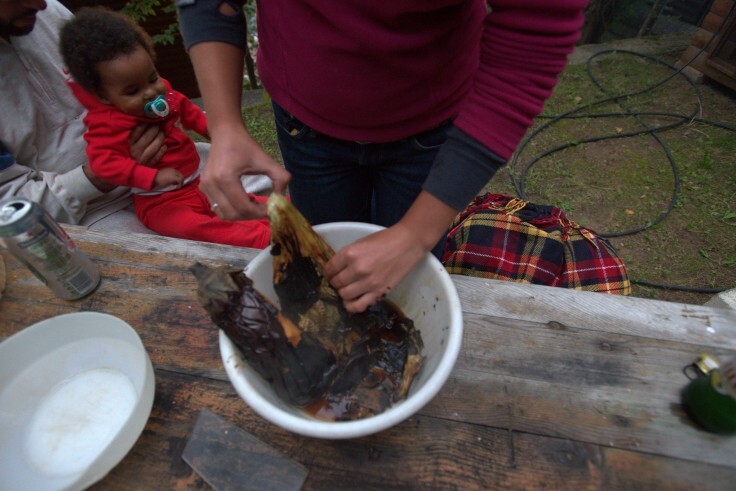 There were some crazy looking mushrooms and we had a fun afternoon. 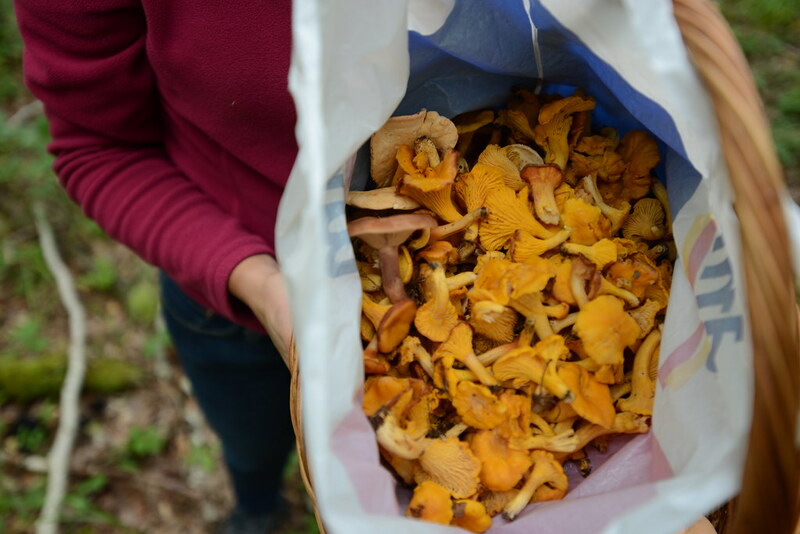 After a fair amount of time we had almost made it to the top and were starting to lose hope in finding the much sought after Chanterelles when André stumbled upon an area filled with the orange-coloured little fungi, loads of them. 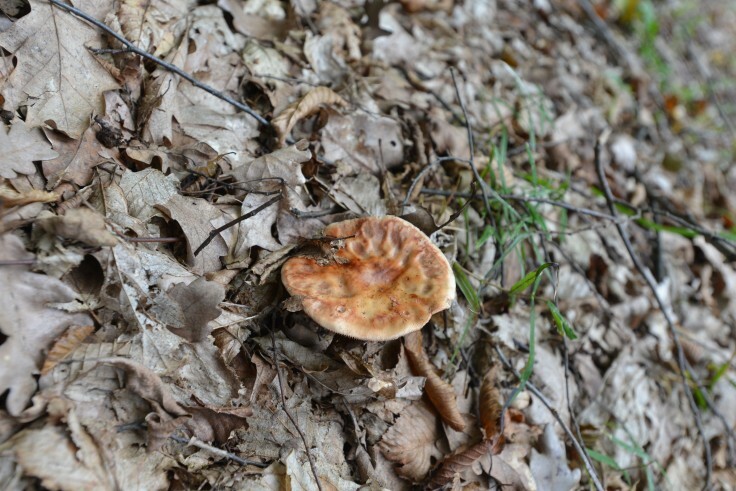 Patches of Chanterelles everywhere! 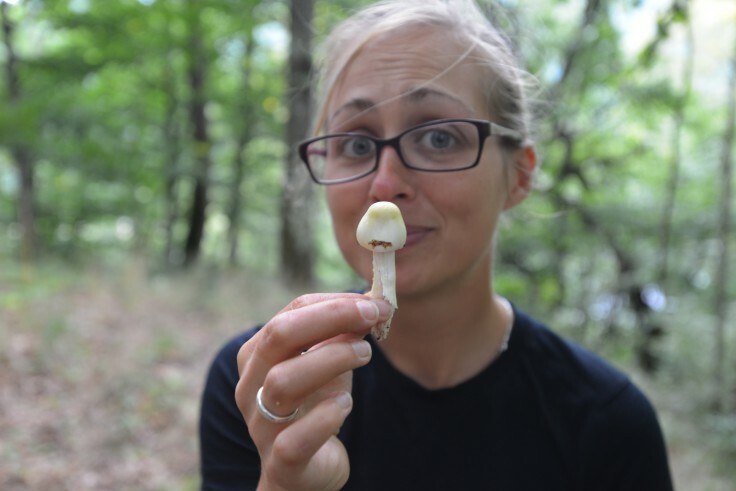 After canoeing back to the cottage we discovered that all of the mushrooms we picked (apart from the Chanterelles) were inedible and a few were even deadly – who would have known! 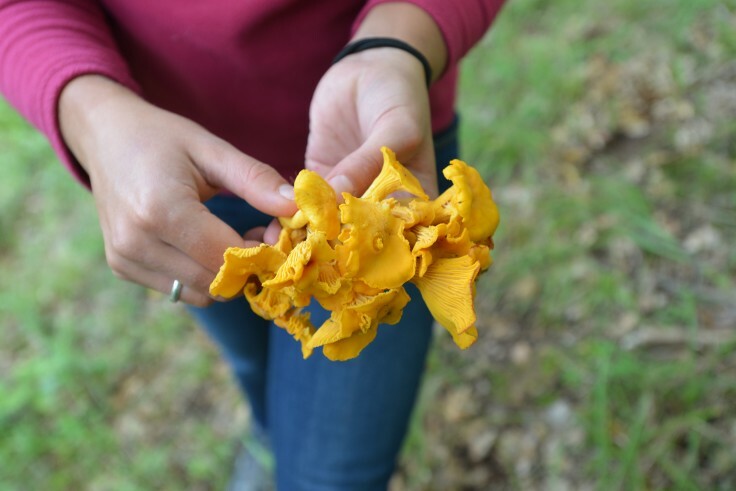 The ones that were deadly were white and looked delicious, we were a little disappointed that we had picked so many inedible ones and had not spent more time looking for Chanterelles, but oh well, we had a fun afternoon anyway. 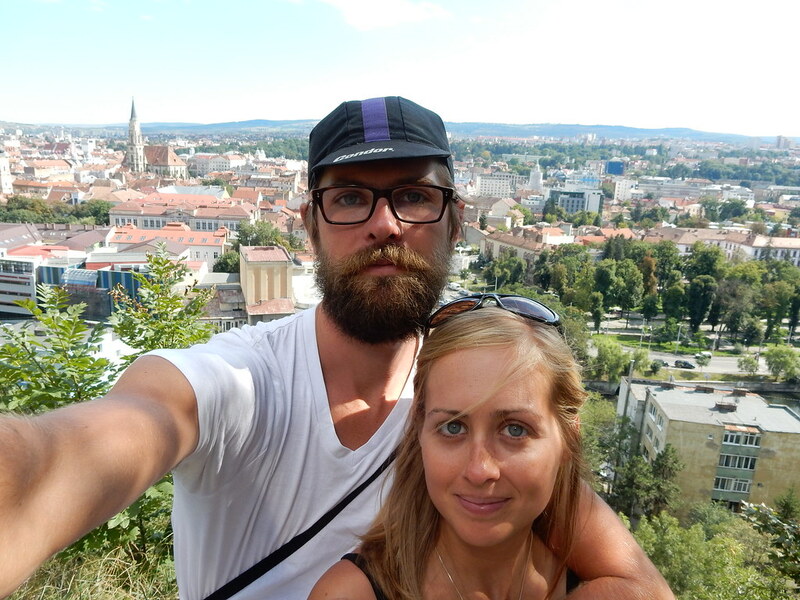 Later that day we cycled in to Cluj Napoca to stay at Stefan and Deanne’s apartment in the city, they had very kindly offered to put us up for a few nights so we could see the city too. 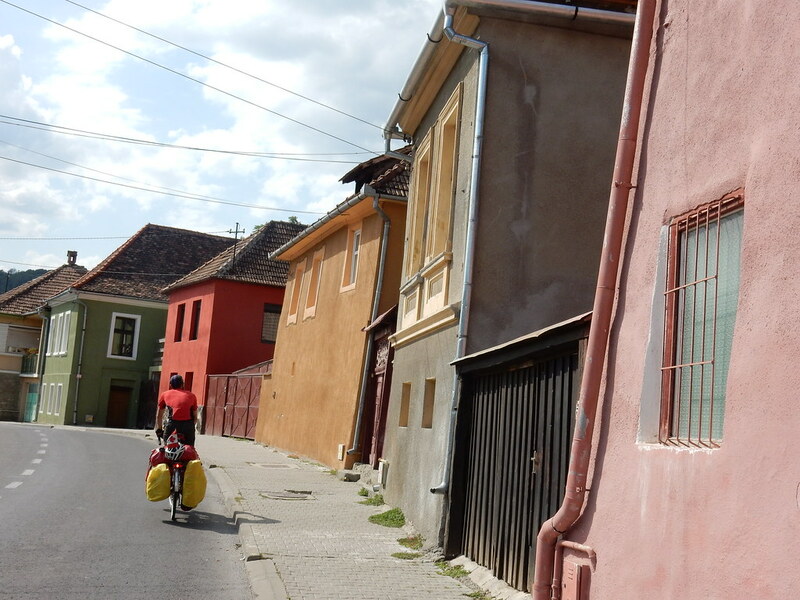 We were excited about this bike ride into Cluj as it was fairly short and for once we had no panniers! 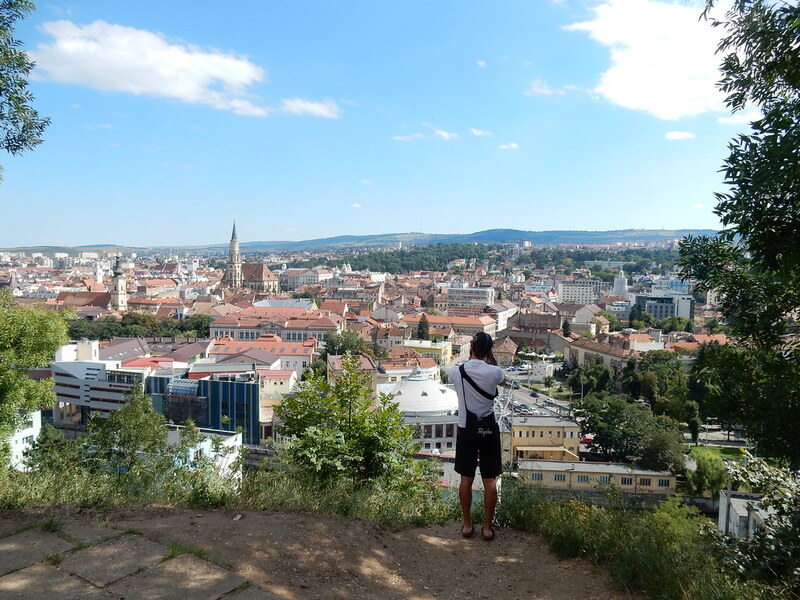 Stefan had packed them in his car and we were able to ride baggage free which was great and we made our way speedily into the city! 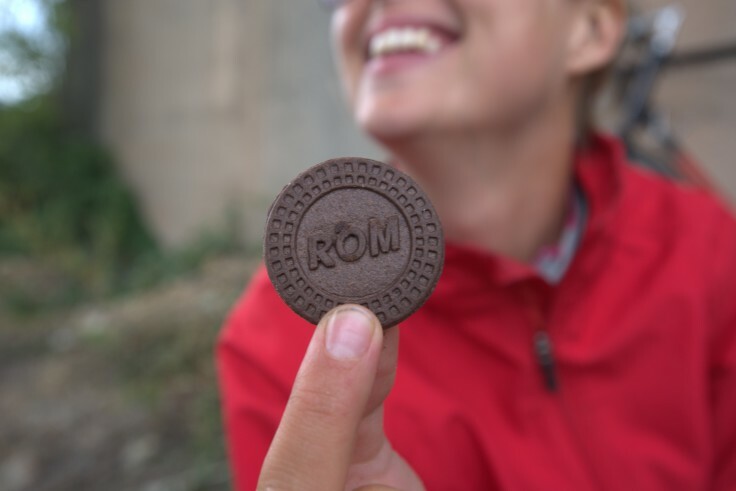 The next few days were spent planning our time in Romania, exploring Cluj Napoca, making pasta dishes with our mushroom haul and hanging out with the Roman family. 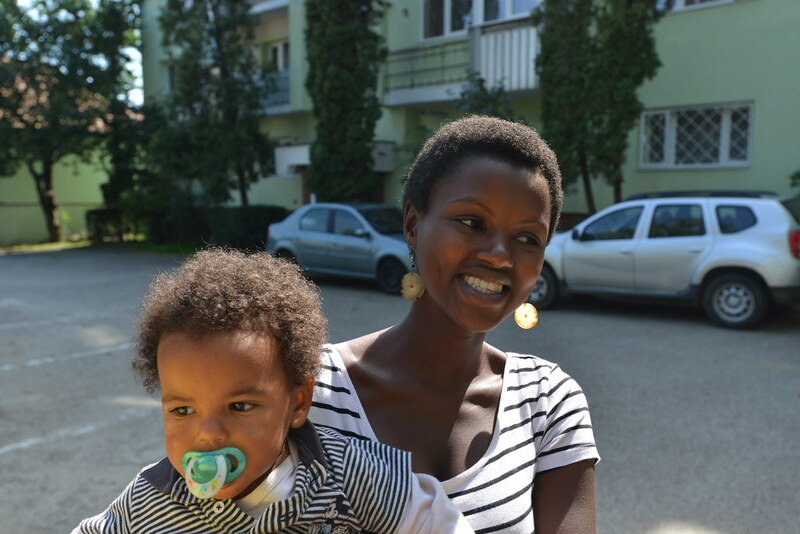 As we have been spending so much time with Stefan and Deanne, Jessica their eldest daughter has become comfortable with us and a lot less scared than she was when we first arrived, which was nice and meant we can interact with her a lot more, she is a real cutie. The city Cluj Napoca is one of the biggest cities in Romania and is a pretty place, located on a river with some nice parks, open town squares and grand old buildings. 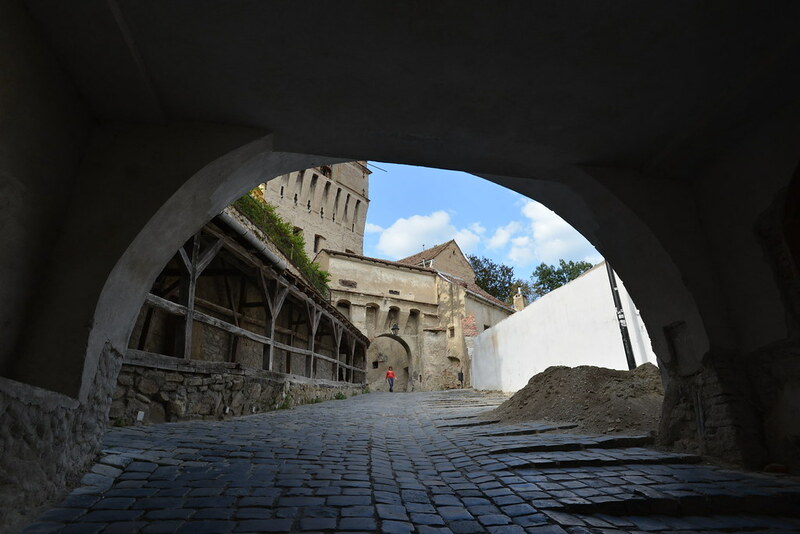 We enjoyed whittling away time in Cluj but after a week of resting, stretching and preparing for the Romanian road ahead it was time to go. We were very sad to say goodbye to Stefan, Deanne, Jessica and Vanessa, we enjoyed their company enormously and can’t thank them enough for their hospitality and warmth and for making us feel a part of their family. If you guys are reading this, we want you to know you are missed! 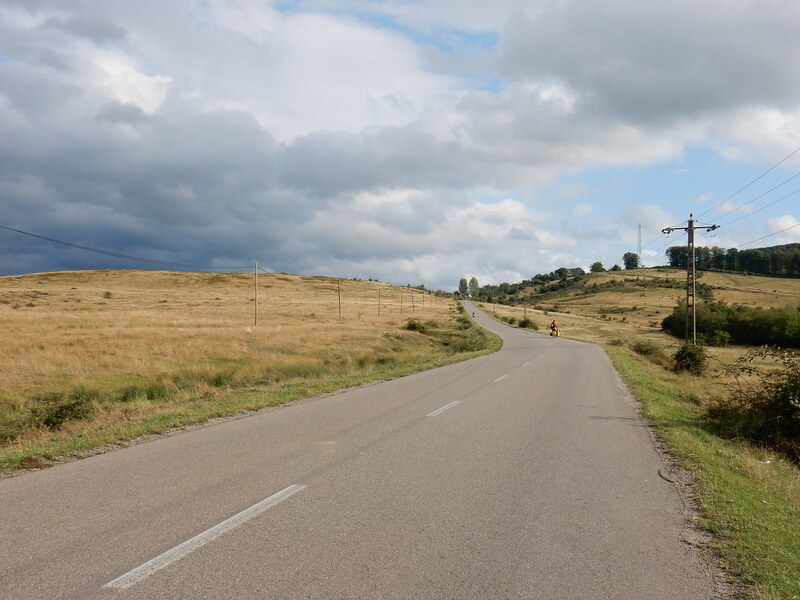 Cycling south out of Cluj Napoca was tough going, with lots of hills but the road suggested to us by Stefan was a very scenic and quiet one. In the afternoon we could see in the distance an impressive gorge and André suggested we should camp in the gorge, this turned out to be an exhausting feat! Firstly, the gorge was inaccessible from the side we were approaching from, so we had to cycle around, which was hilly and a long way around; and then the climb to the gorge itself was a very steep series of hills on a terrible road surface which consisted of loose gravel and rocks (I managed to fall over and then had to push my bike up the hill). 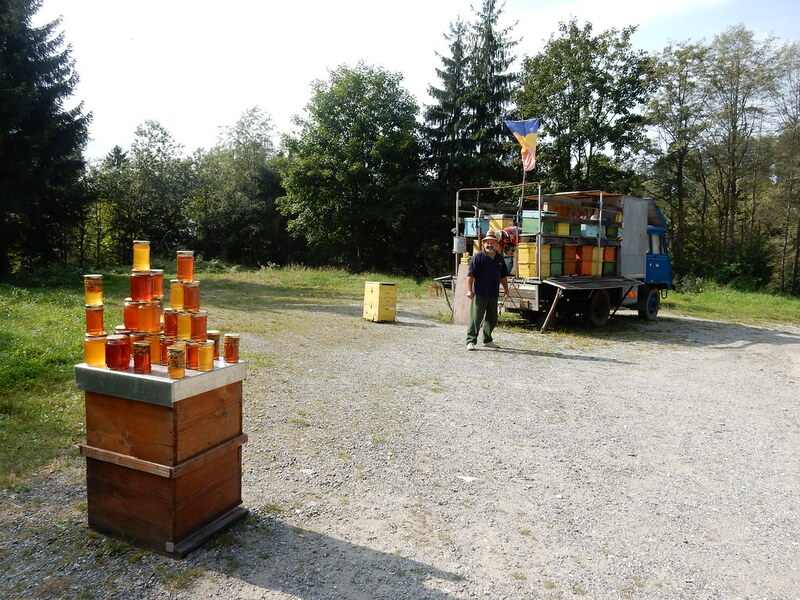 Finally, we descended down a short but steep section of paved road towards the gorge and as we reached the bottom we cycled upon a free campsite and a chip van – I felt elated to see both of these things! 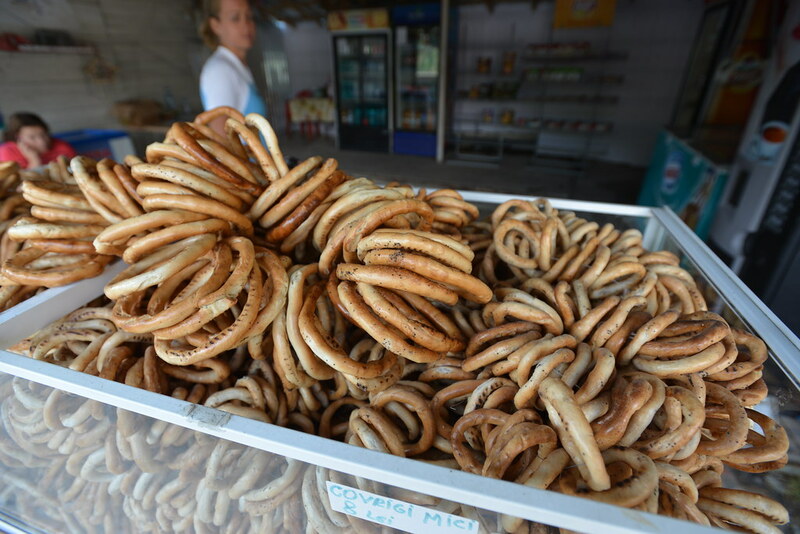 As we were wolfing down chips and coke, some friendly Romanians came over and chatted to us and also gave us our first taste of mici (which is shaped like a sausage and is usually a mix of ground beef and pork) you eat them with mustard and they are pretty tasty. 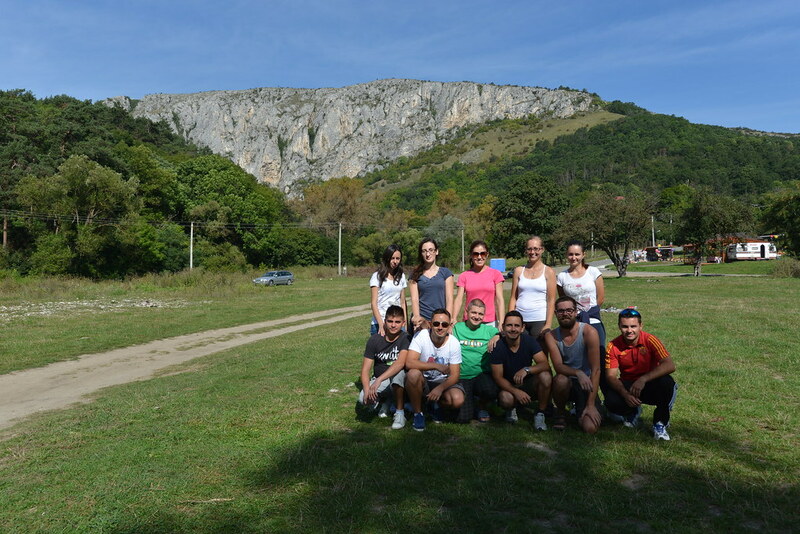 After setting us camp we were befriended by yet more friendly Romanians, this time it was a big group of young people on holiday touring around their country. 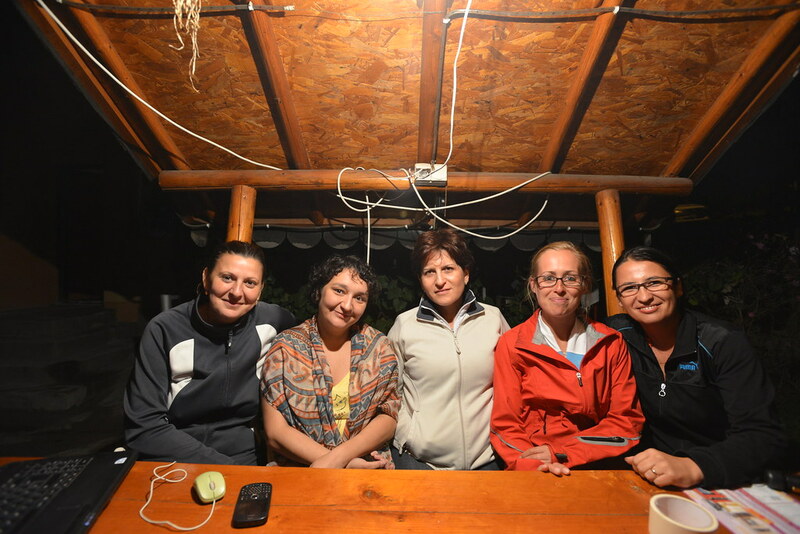 They beckoned us over to join them and we had a really fun evening, chatting about what it is like to live and work in Romania, drinking lots of home-made wine and eating their delicious bbq food with them. All of them were really kind and welcoming and it was nice to be invited to join their party. The next morning was another failed attempt to leave early, due to a combination of more socialising with people on the campsite (a lovely German couple who left their jobs to travel and climb their way around Eastern Europe), wanting to visit the Gorge and feeling slightly hungover from all the home-made wine! In the end we didn’t really even get to see the gorge as it was really a half a day’s hike at least to do the place justice and you had to pay to get in, so we made do with a short walk into the Gorge before heading back to start cycling again. 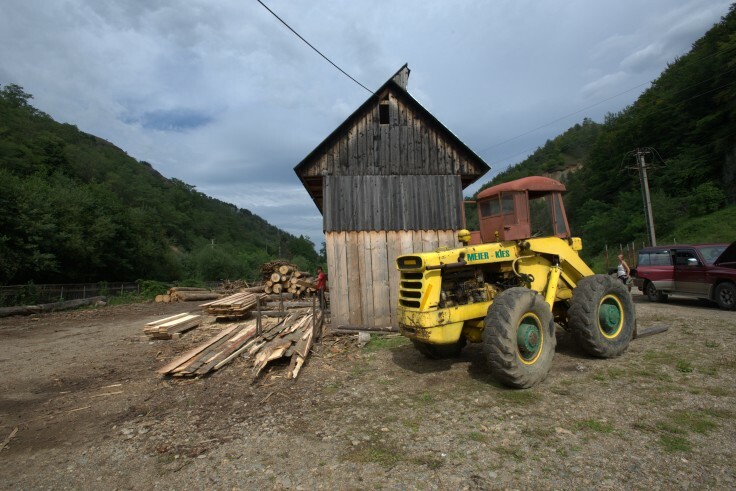 These things happen I guess; it would have been nice to linger but we had just had a week off and felt like we needed to make some progress across Romania. 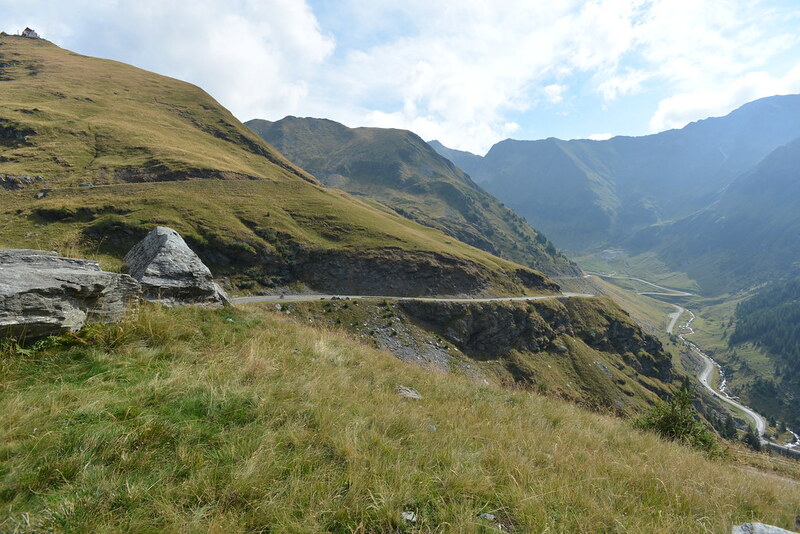 Apart from the horrifically steep climb back to the road, it was a flatter day’s ride than the previous one, however the route was not very direct and largely on wiggly, windy tracks rather than roads. This made it a beautiful day’s cycle but not very speedy one. Our evening of camping was one of our strangest evenings to date! 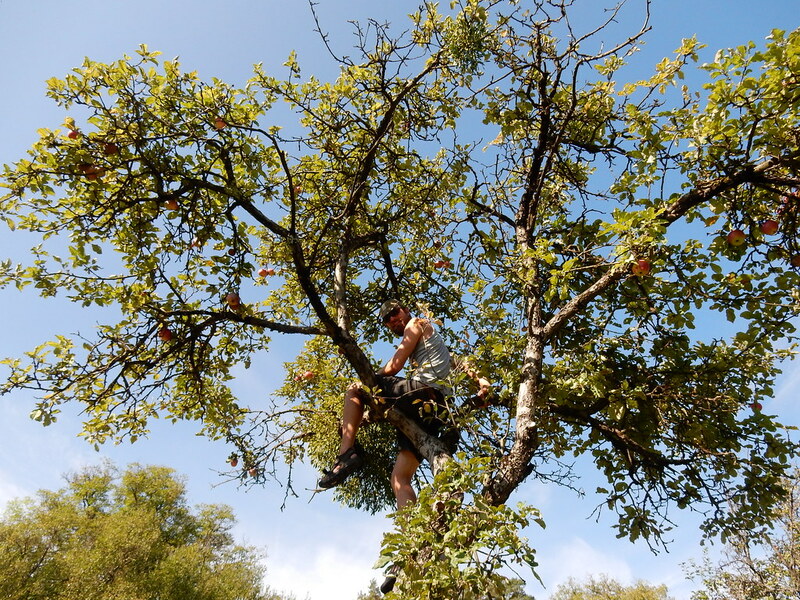 We were struggling to find somewhere to camp as most of the area was agricultural and just consisted of ploughed fields or fields of crops – not great for camping, so we ended up asking a farmer if we could camp on their land. 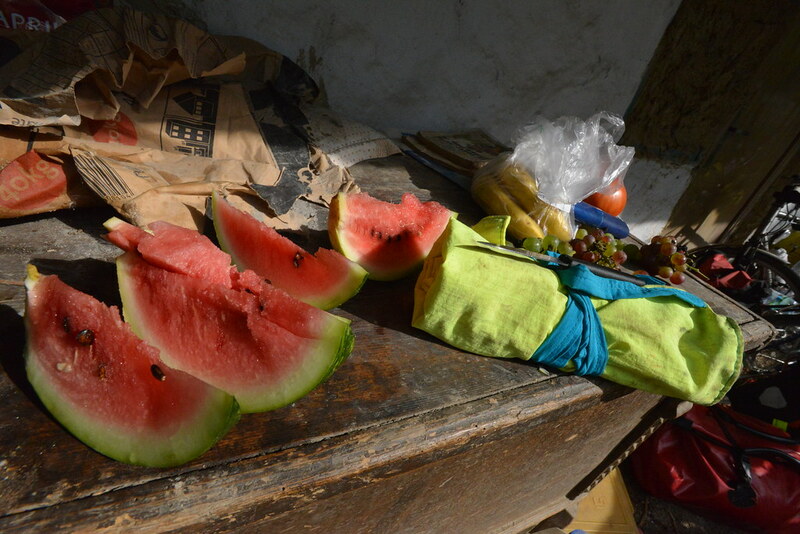 This led to a neighbour (a very gruff but friendly farmer in his 50s) taking us to camp outside his house and giving us a huge amount of food including watermelons, tomatoes, eggs, grapes, peppers – everything that they grew or produced, it was incredibly kind. 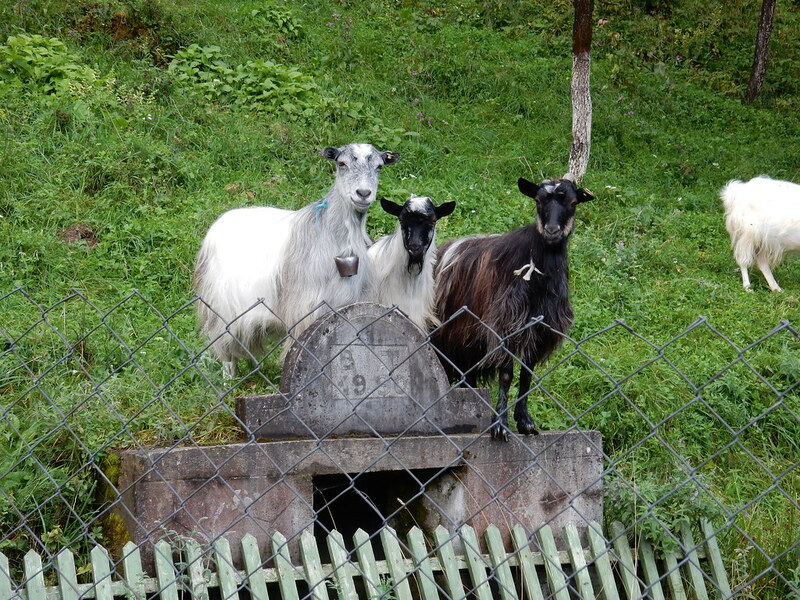 We also met the farmer’s wife and later in the evening after dinner, they motioned for us to follow them in the dark down some road, they didn’t speak any English so we had no idea why, but we followed them regardless anyway! 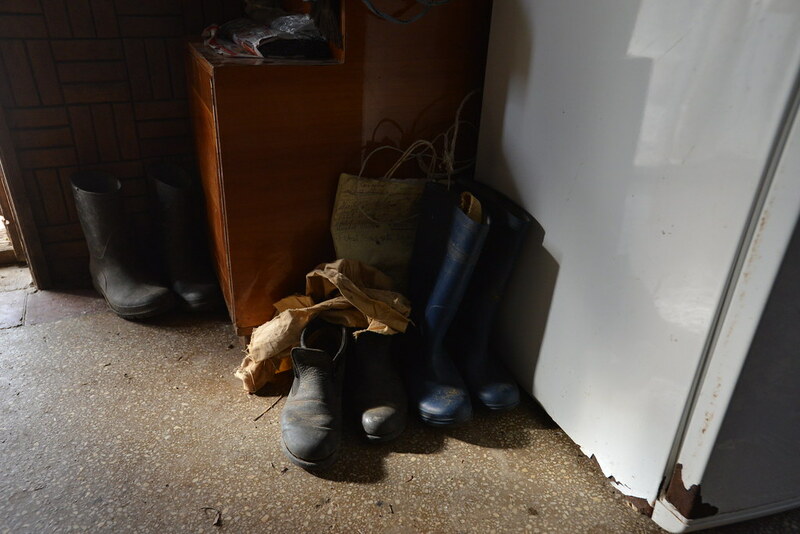 When we arrived at our destination it was a small barn with three cows and a very cute calf inside. Through the medium of mime we were informed that the calf was destined to be slaughtered shortly and for a scary moment we thought it was going to happen there and then which neither of us felt prepared for! However, luckily they just wanted us to have a go at milking a cow and show us how it is done properly! I really didn’t enjoy the experience at all, I didn’t like the feel of the udders and didn’t enjoy the force of which you had to squeeze, and it felt like it might hurt! André went next and he did much better, but both of us were completely shown up by the farmer’s wife who milked like a pro! 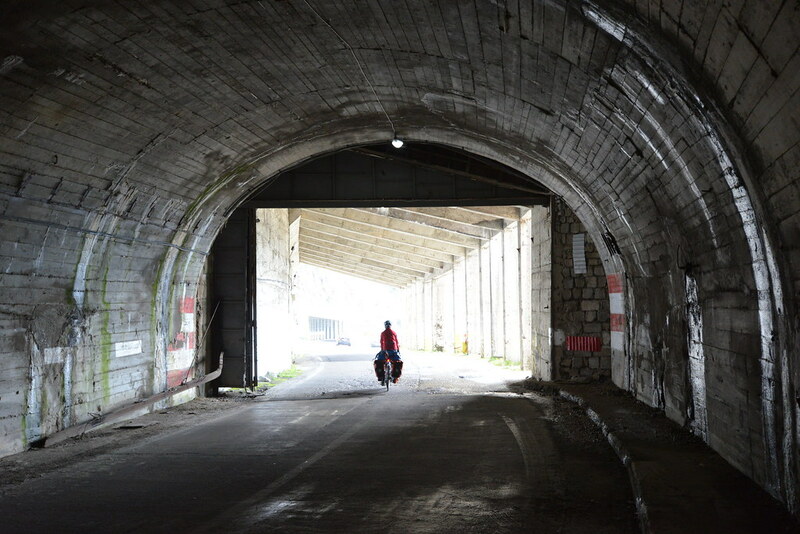 After the milking the farmer wanted to take us further away from our tent, bikes and all our belongings and further down this dark road, which made us slightly nervous to say the least. 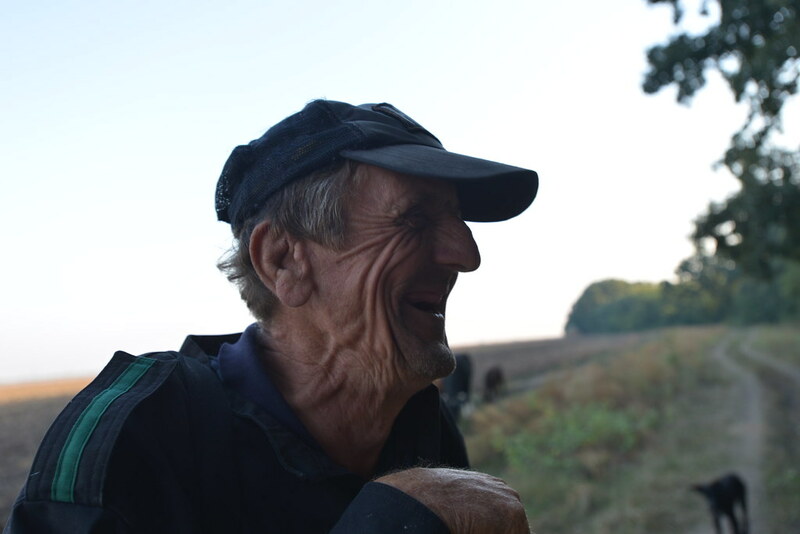 In the end we decided we felt too uncomfortable about leaving all our worldly belongings and that we didn’t know this farmer well enough to completely trust him so we told him we were turning back and going to sleep. He seemed incredibly disappointed and upset with us and we felt pretty guilty especially when we got back to the tent and everything was fine! 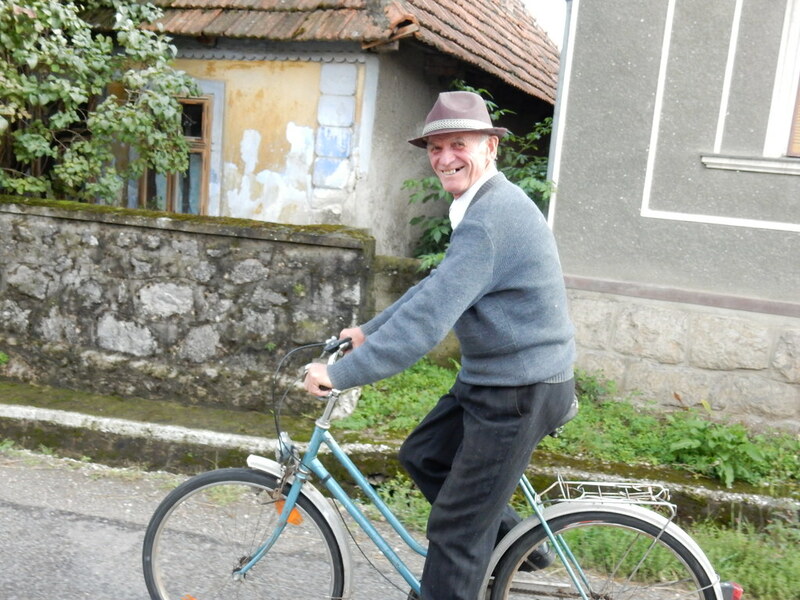 André felt pretty bad and we realised that he just wanted us to go to the bar with him and have a drink, so André decided to cycle back and find the farmer to buy him a drink and smooth things over. I stayed in the tent and André returned about an hour later having had a couple of beers and making peace! 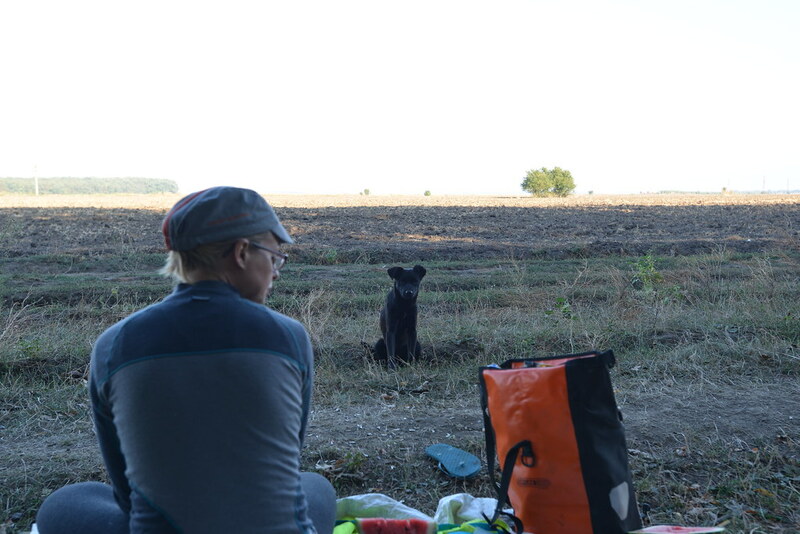 The farmer ended up sleeping outside our tent for most of the night to stop the dogs barking at us which was a little strange and in the morning he was up and outside our tent again by 8am with a bottle of Palinka (Romanian very strong liquor, kind of similar to grappa)! 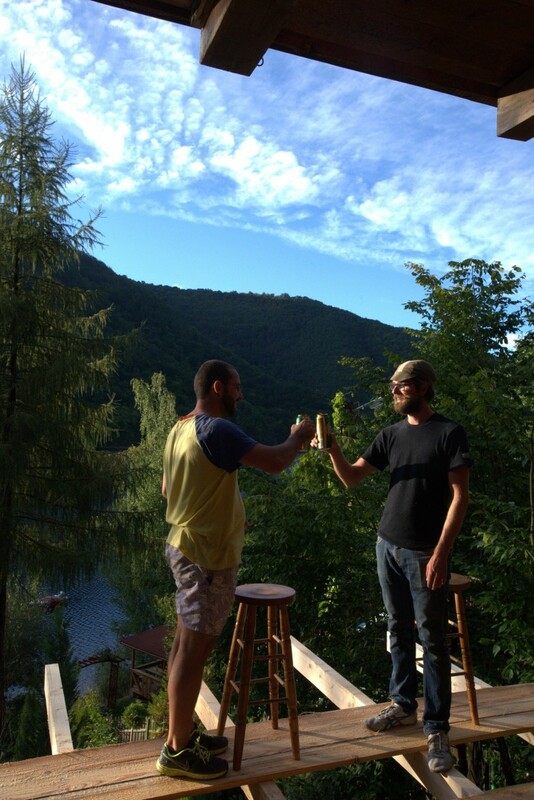 He offered us both a glass of Palinka, I declined but André drank his! It is strange for us to think how quickly our lives have changed in such a small time and how far we feel from our little house in Greenwich, which we were comfortably living in only a couple of months ago! 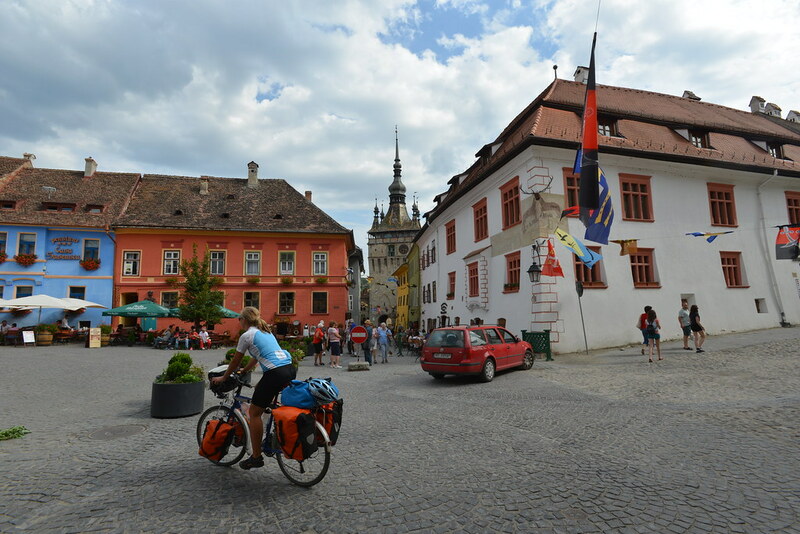 After a couple of days cycling, one very difficult with headwind, very steep hills and bad tracks rather than roads, and the second much easier on a flat, straight main road, we arrived into Sighisoara. 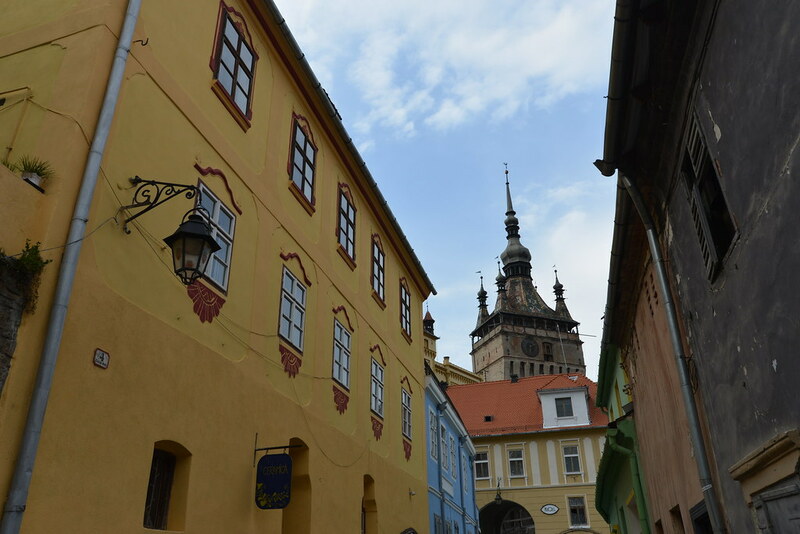 The city is a UNESCO heritage site and is made up of two parts, the fortified medieval stronghold built on top of a hill and known as the Citadel, and the lower town. 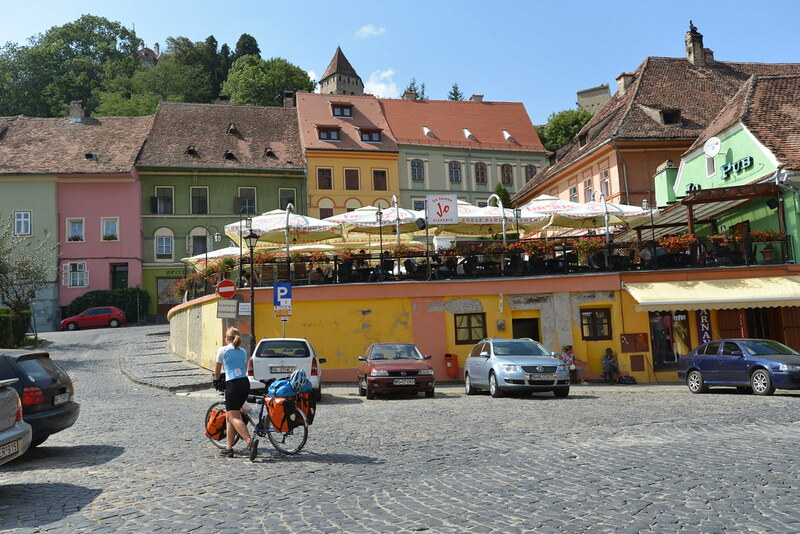 Sighisoara is considered to be one of the most beautiful and well preserved citadels in Europe and it is one of only a handful in Eastern Europe that is still inhabited. 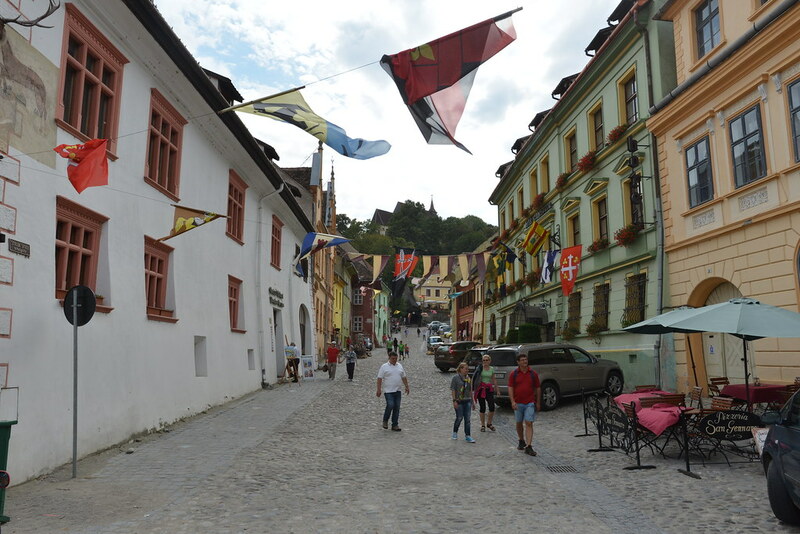 We spent the afternoon having lunch and exploring the town, it is one of the more touristy places we have been in Romania which had its ups and downs. 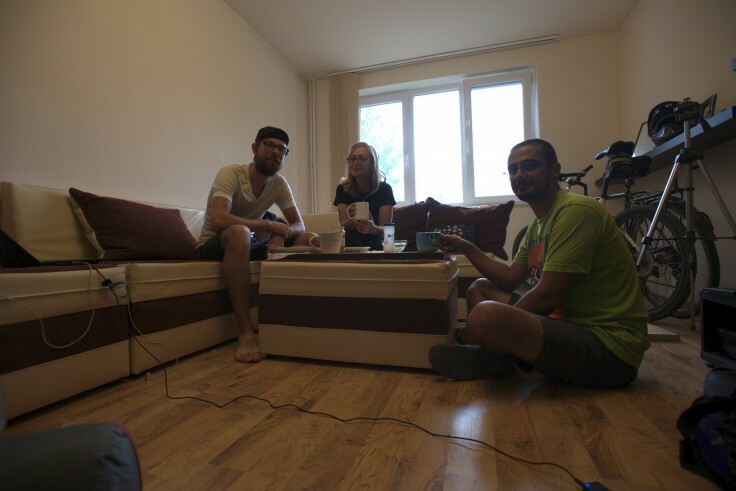 On the plus side we met a lot of people who were also travelling around Romania from all over Europe and North America, which was nice as we got to chat and exchange stories. 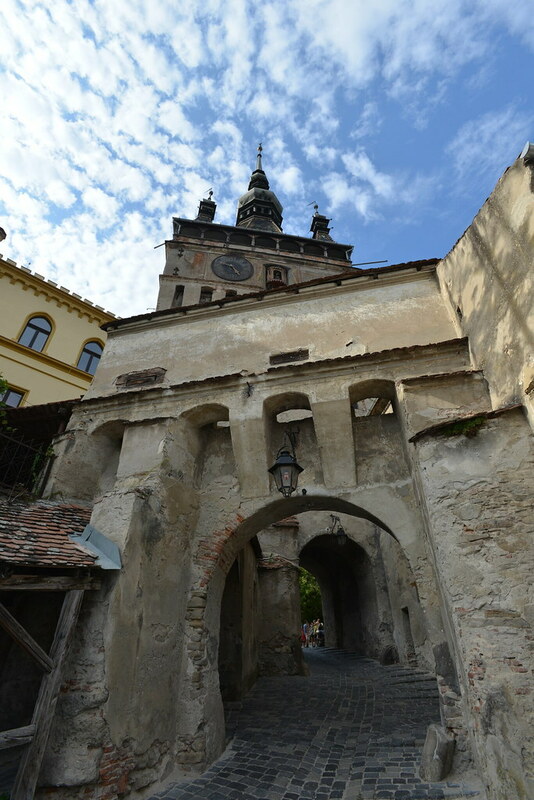 On the downside the town was besieged by gypsy folk who would pester you constantly for food, money or anything really. 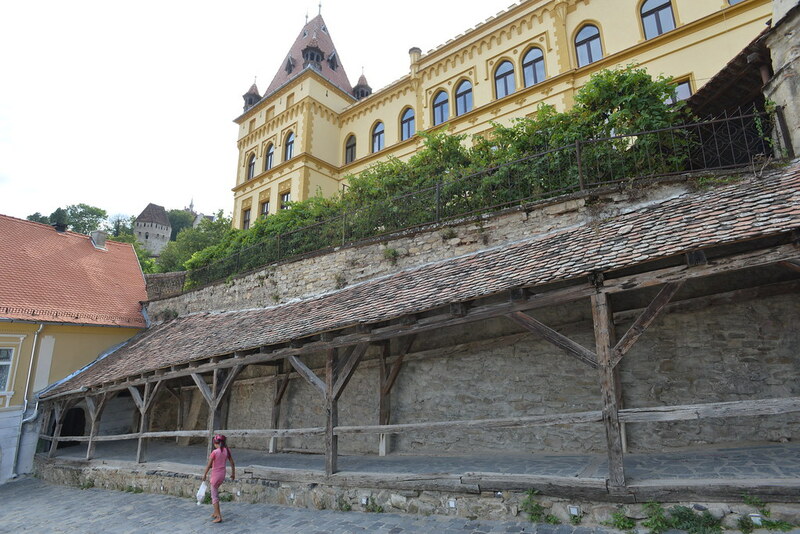 This has rarely happened to us in Romania but it has happened in a couple of places recently and in Sighisoara it was the worst. 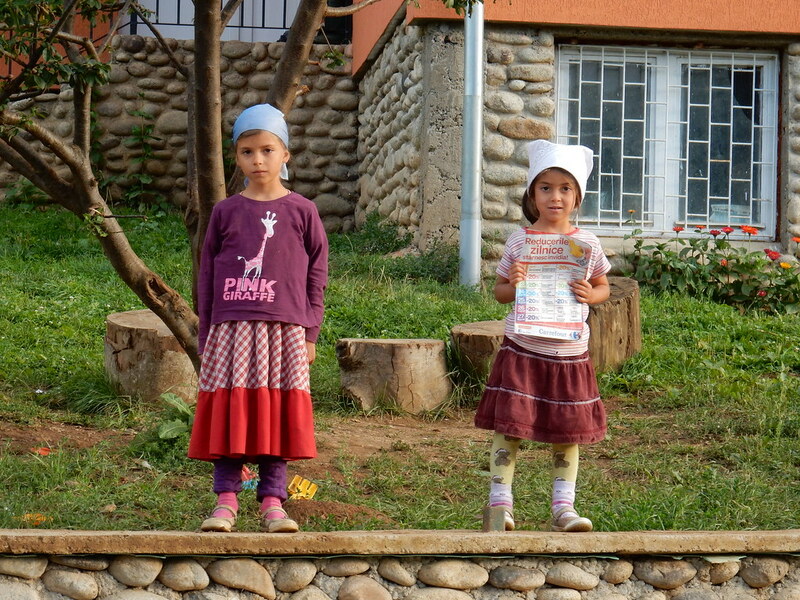 We were sat in a park eating lunch and there was a large gypsy family in the park who were all happy, content and playing games until they spotted us, then the children took it in turns to come over and beg us for food or coca cola! It was pretty annoying as they were very persistent and also because they were clearly well-fed and clothed, we didn’t really know the correct way to deal with it other than to ignore them which didn’t really seem to work! In the end other Romanians came to our aid and shouted at them to go away and stop bothering us which was great and had a far better impact then us ignoring them had had! 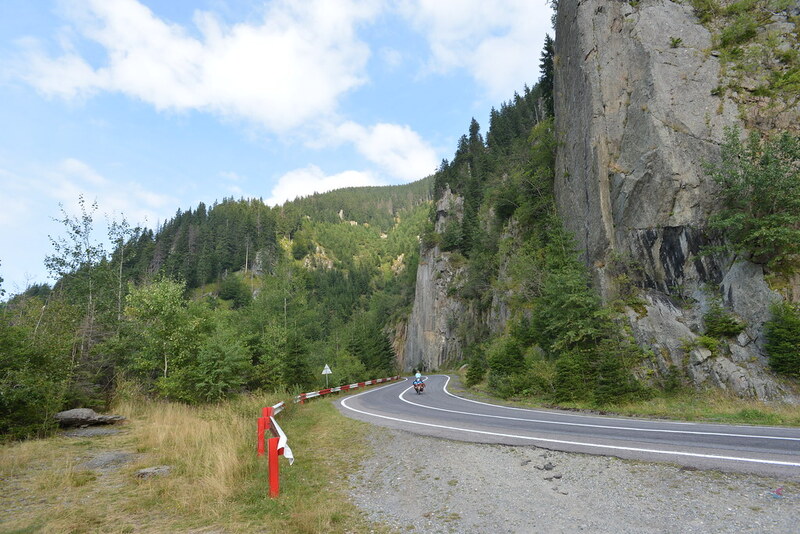 The next day’s ride took us almost to the foot of the Carpathian mountains and we got our first glimpse of these almighty beasts! They were incredibly intimidating and rose up in front of us completely dominating the skyline for most of our afternoon, reminding us of what was ahead tomorrow. 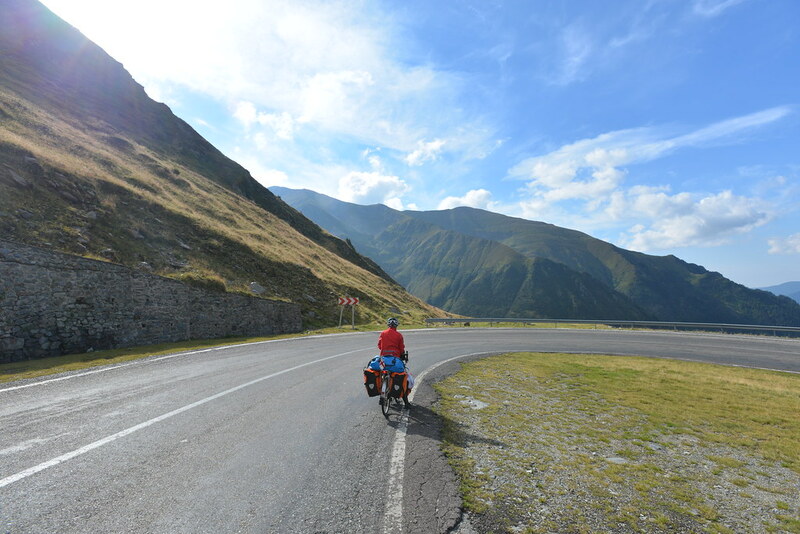 I felt particularly nervous as I could not for the life of me imagine how we would get over these enormous mountains on bikes, it seemed impossible. But I guess we would find out in the morning…. 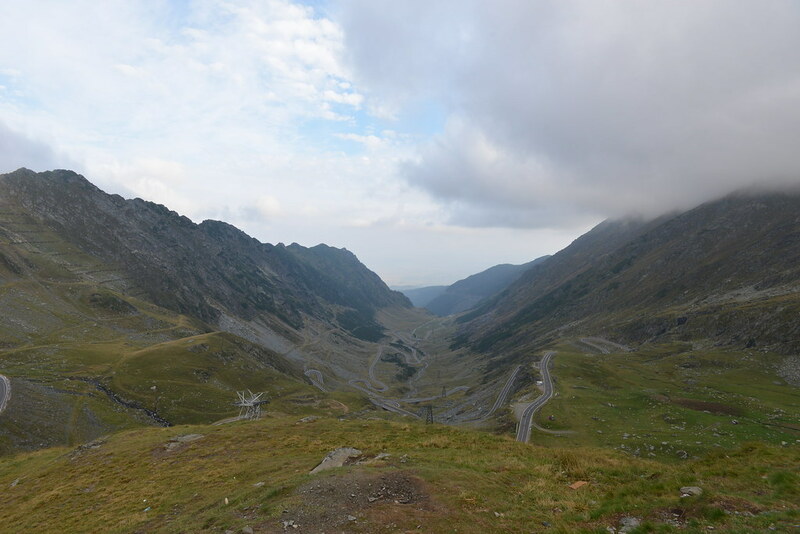 The route over the mountains we had decided to take was the Transfagaras Highway. The road featured in an episode of Top Gear in 2009 and stated by Jeremy Clarkson as the ‘Best road in the World’, I don’t generally agree with anything Jeremy Clarkson has to say but this road was pretty spectacular! We woke up refreshed and ready to summit the mountains only to faff around in classic Claire and Dre style for hours, which meant we didn’t start the climb up the mountain until lunchtime when the sun was at its most intense – not a smart move! 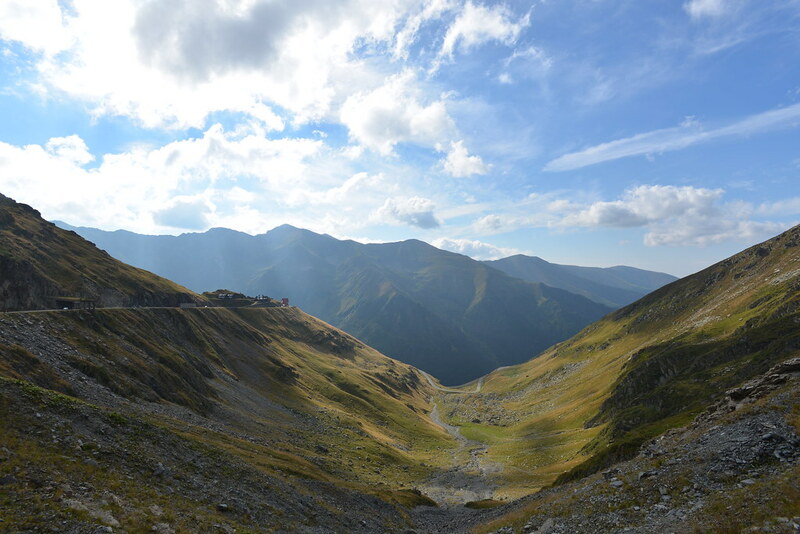 It also meant we only had the afternoon to summit the Carpathians rather than an entire day. 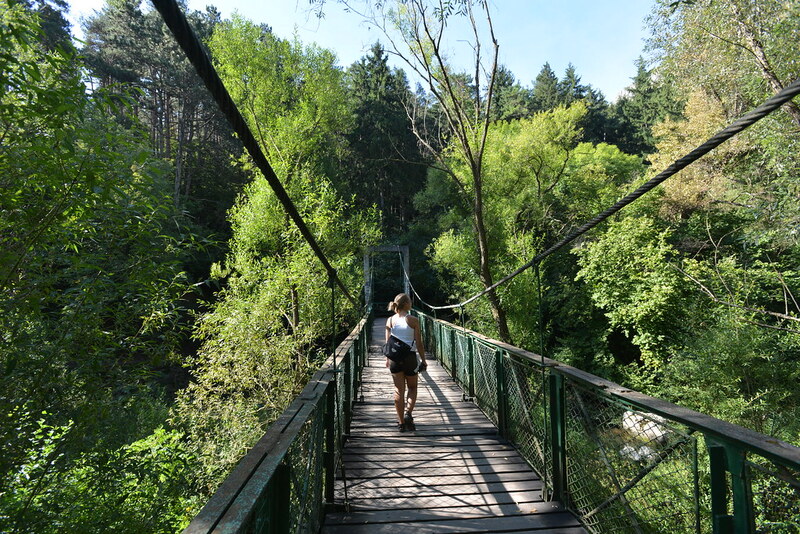 The climb itself was okay for the first 20km or so, it was not too steep and we kept a slow but steady pace taking regular stops for snacks and sugary treats! 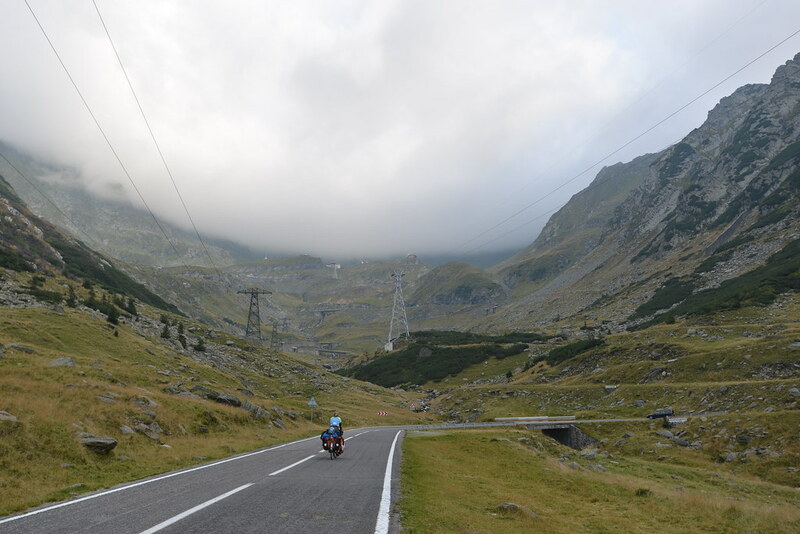 One particularly nice part of the climb was the many, many motor bikers and car drivers who beeped us, waved and shouted encouraging things on the way up (well we are assuming they were encouraging things but who knows as our grasp of the Romanian language is pretty limited). 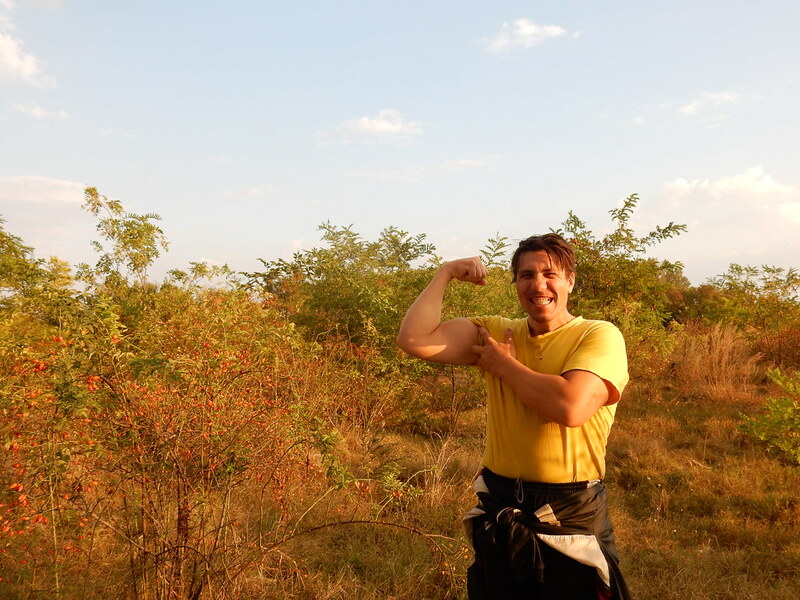 For a while there wasn’t much to see as we were climbing through forest and the trees obstructed any views we might have had, after some time however the trees thinned out and it became rockier and this is when things really became incredible. 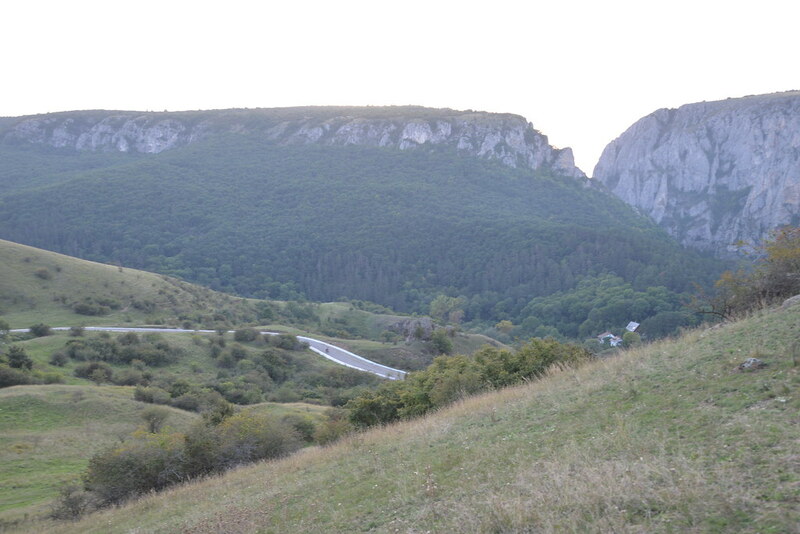 The views were spectacular, you could see what looked like all of Northern Romania laid out before you and around every bend it was another photo opportunity as we were now cycling along the cliff face, it was fantastic. After roughly five hours of climbing I started to feel tired and as I was pretty sure we must be near the summit. Unfortunately and much to my shock and horror, we rounded a corner only to be met with what looked like a sheer cliff face with hundreds (slight exaggeration maybe but at least 20 I would say) switch-backs going all the way to the top of the cliff face. It looked impossible to climb especially after five hours of climbing already and I was pretty despondent. André was fine and seemed to relish the challenge ahead which was very annoying! By now the sun was quickly disappearing behind one of the mountain peaks and it was getting much colder. Even though this cliff face road was daunting it was very beautiful and I can honestly say I have never seen anything like it. The landscape was very rocky and had lots of scrubs and heather and reminded me of Scotland, however I can really not do it justice in words so you will have to take a look at the photos, and I am not sure they do it complete justice either – so you will just have to go and ride it yourself or at the very least drive over it! 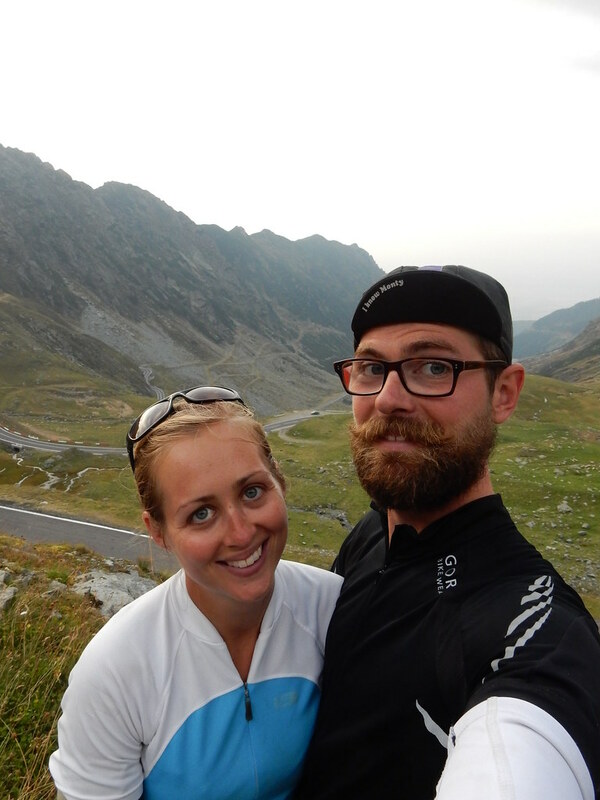 After what felt like a very long time and a lot of encouragement from André and random drivers we both finally made it to the top – exhausted but exhilarated we were 2034 metres high! The views were breath-taking, really awesome, but the summit itself was somewhat anti-climactic. Lining the road at the summit were lots of overpriced stalls selling tat and the little lake Balea was surrounded by three (I think) hotels and restaurants. As it was now 8pm, dark and freezing cold we didn’t complain too much about the restaurant as we couldn’t get in there quick enough! We devoured three courses in record time with a celebratory beer or two! Pitching the tent in the dark when we were both very tired was not much fun but sleeping on top of the Carpathian Mountains with a full moon, a clear sky full of stars and the twinkling lights of Romania stretching out below was pretty special and something I will remember for a long while. 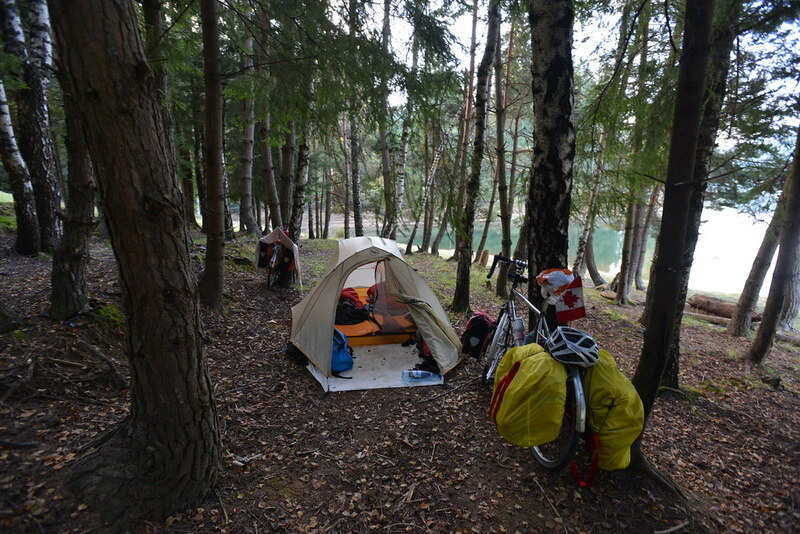 The next morning André was up bright and breezy, whereas I was tired, grumpy and the last thing I wanted to do was get on a bicycle but André convinced me to descend down to a sunnier, warmer lake to relax for the rest of the day. 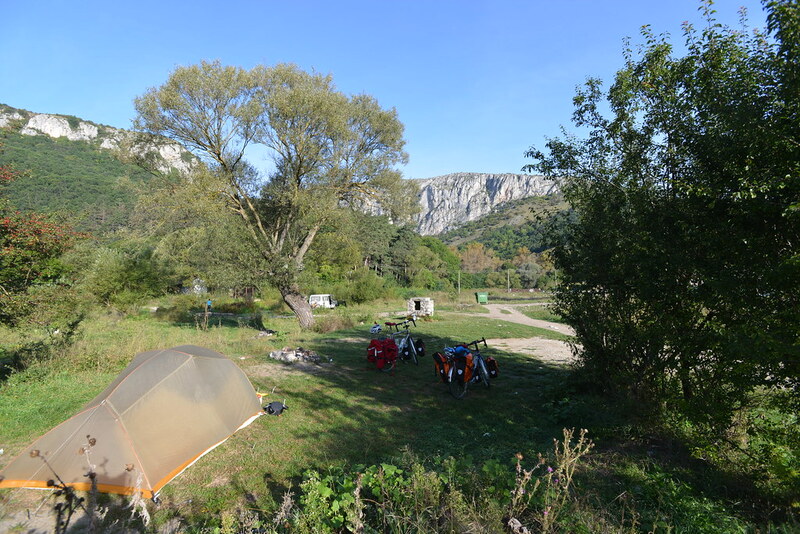 We also discovered that in the dark we had managed to pitch our tent within the hotel boundaries (although how you could possibly know this I am not sure as there are no signs) and according to one of the hotel employees we now owed them for a night’s camping! 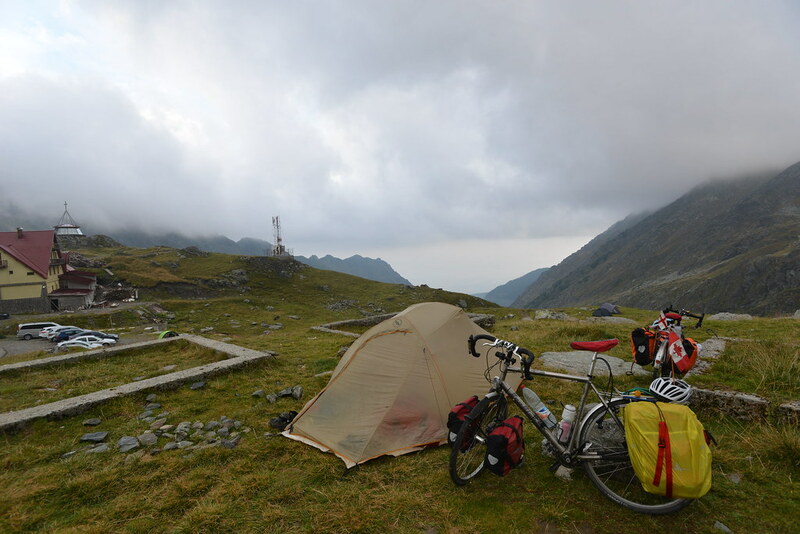 After unsuccessfully arguing for a while we ended up paying up, which was annoying as you can basically camp anywhere on the mountain for free apart from the spot we pitched our tent! Oh well. 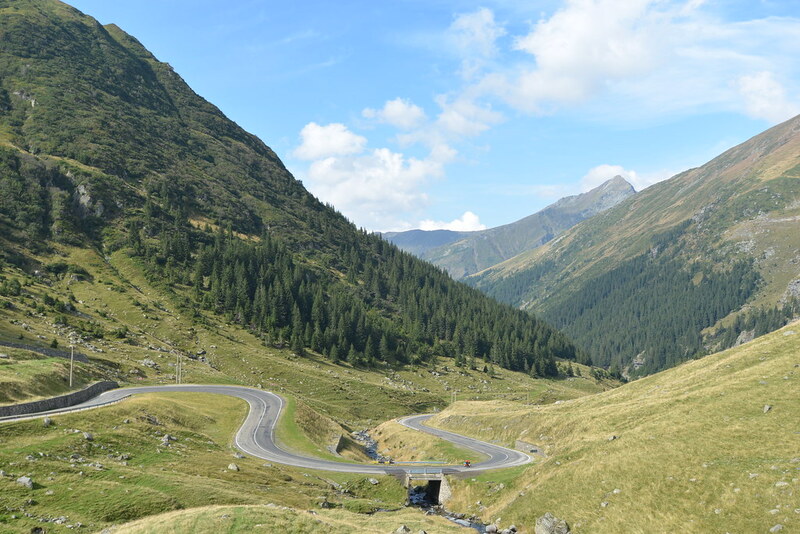 The descent down the mountain was one of the most incredible stretches of cycling I have ever done. 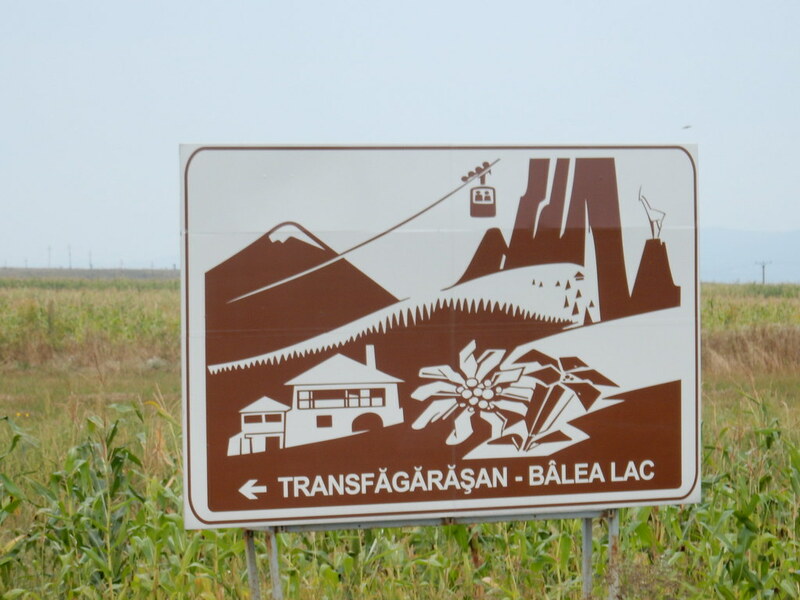 It was stunning and gliding down the mountain whilst taking in the views was exhilarating. 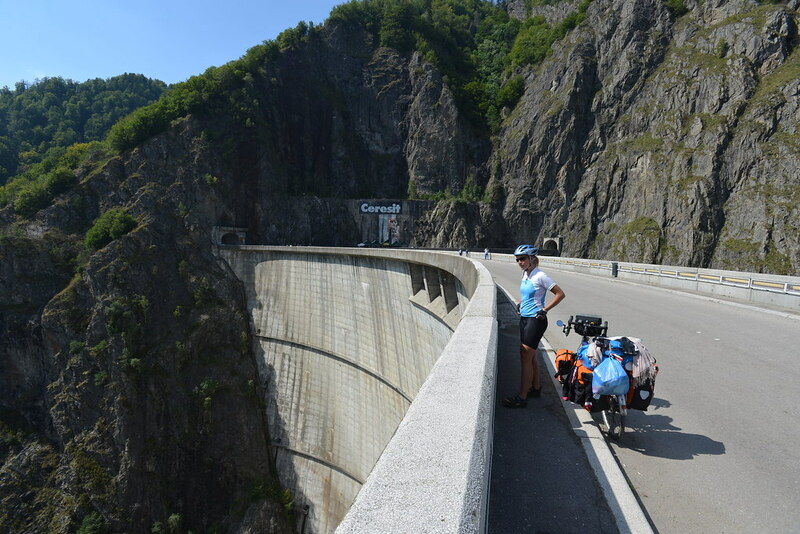 We kept stopping partly because we wanted to take photos and partly because we didn’t want it to be over too quickly! It was switchback after switchback for a long way down the mountain before descending into the forest. 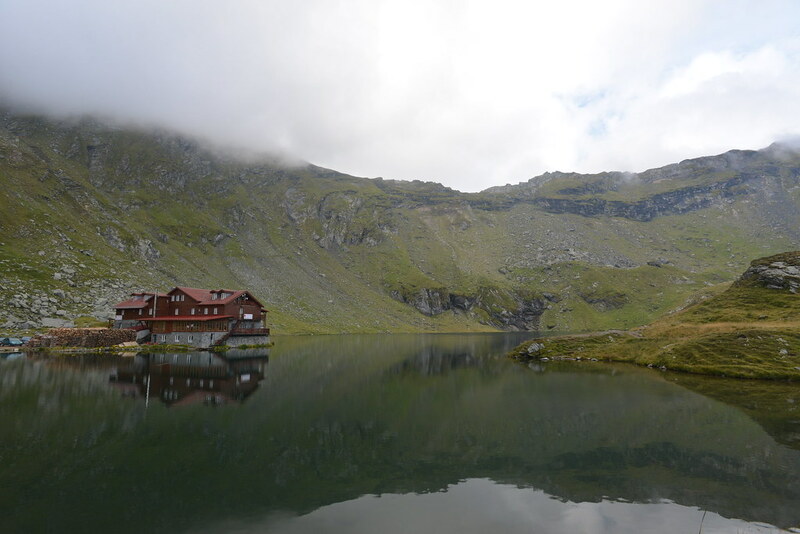 After 40kms of descent we found a little road down to a lake and a camping area with a fire pit, it was a perfect place to stop and enjoy an afternoon of relaxing and swimming. 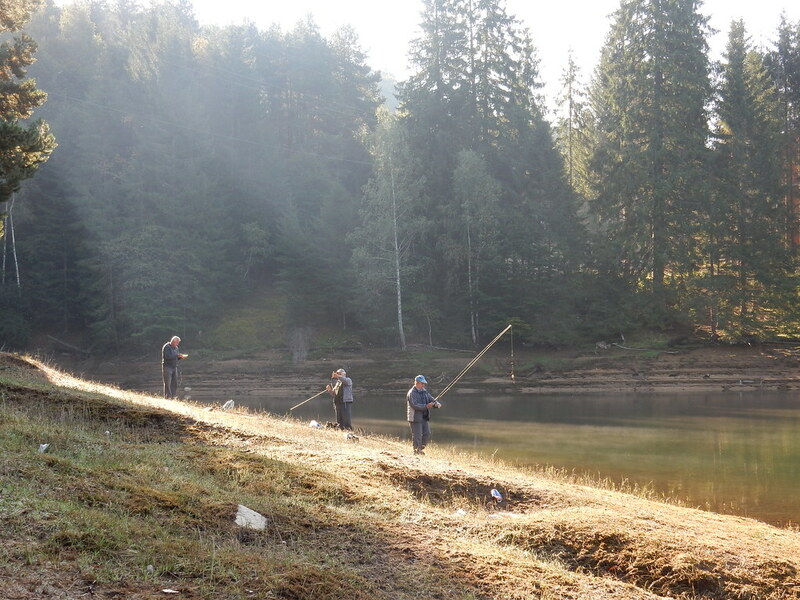 The only unfortunate thing about this idyllic spot was all the rubbish that was strewn across the area, beer cans, plastic bottles, paper – it was terrible and we spent a while picking some of it up. 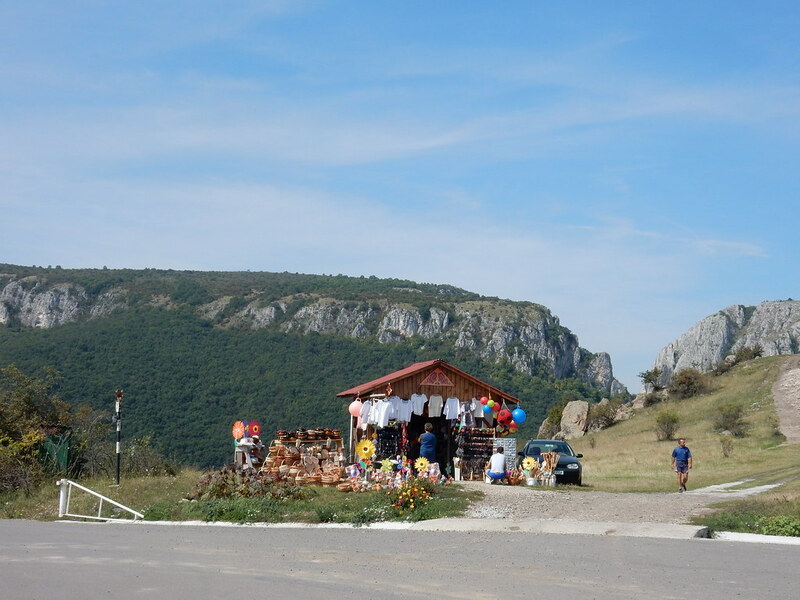 One real shame about Romania is the litter everywhere, you could visit the most scenic place and people will have ruined the spot by turning it into a rubbish tip. It seems to be a cultural thing as people don’t seem to think anything of just dumping all their rubbish wherever is most convenient. 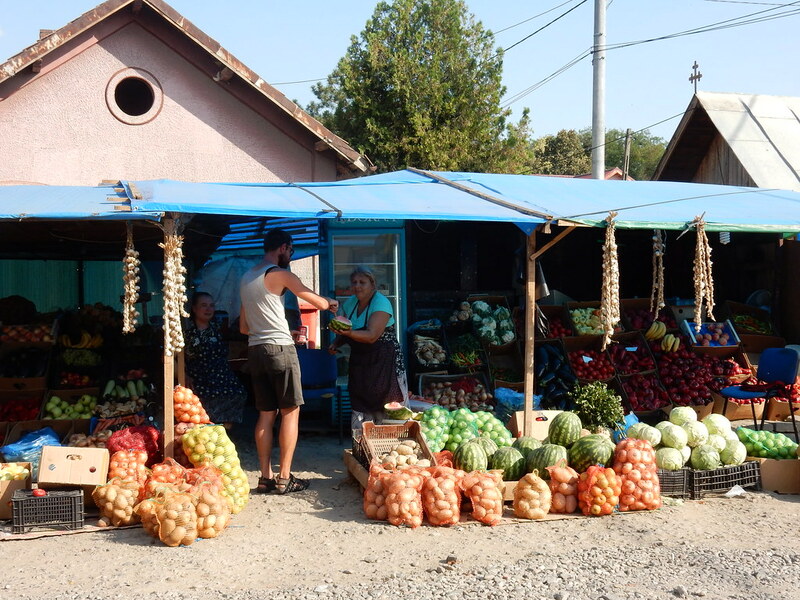 Obviously it isn’t all Romanians that do this and we met quite a few people along our travels that seemed just as bothered by it as us but on the whole it is a big problem for the country and one we hope they solve in the future. 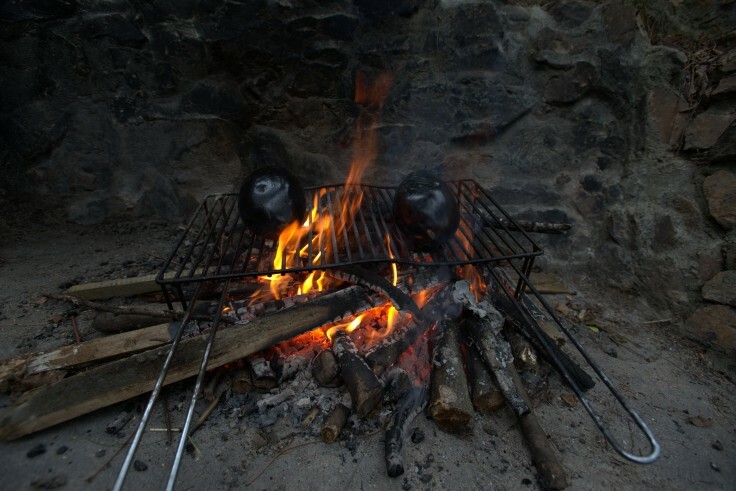 In the evening we enjoyed our first fire of the trip expertly built by Andre with a full moon and a hot chocolate – it was a great day! 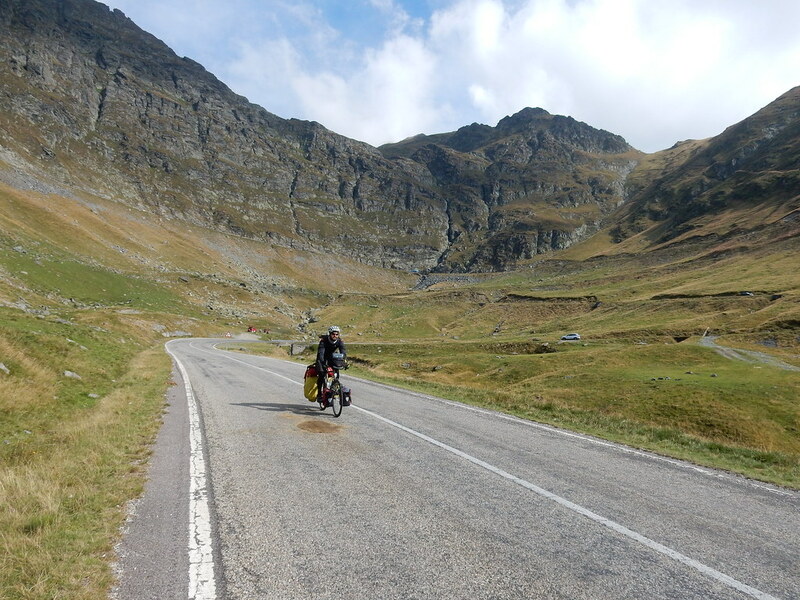 Continuing down the mountain the next day was great, for a long while we followed the road around the lake and it was enormous, the cycle around involved quite a few small climbs which my body did not feel ready for and it ached as I climbed! 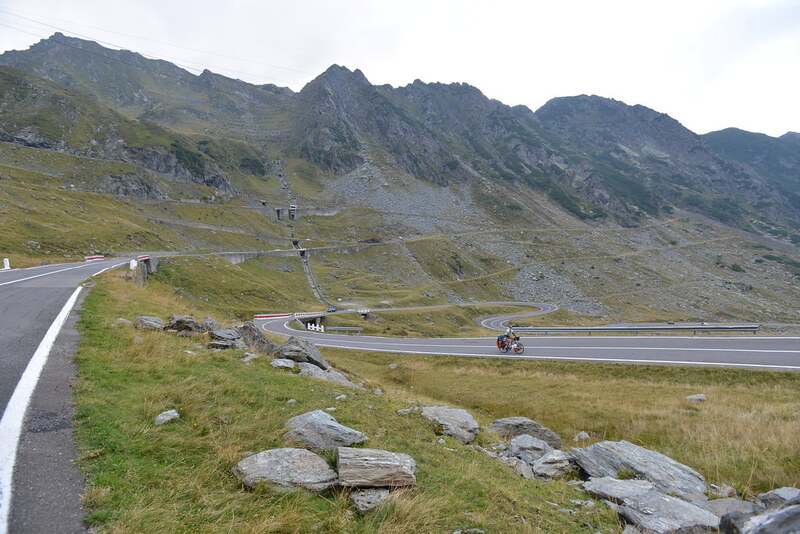 We passed a group of young Polish cyclists who were flying up the mountain at an impressive speed, and stopped to chat with them for a while before they sped off. 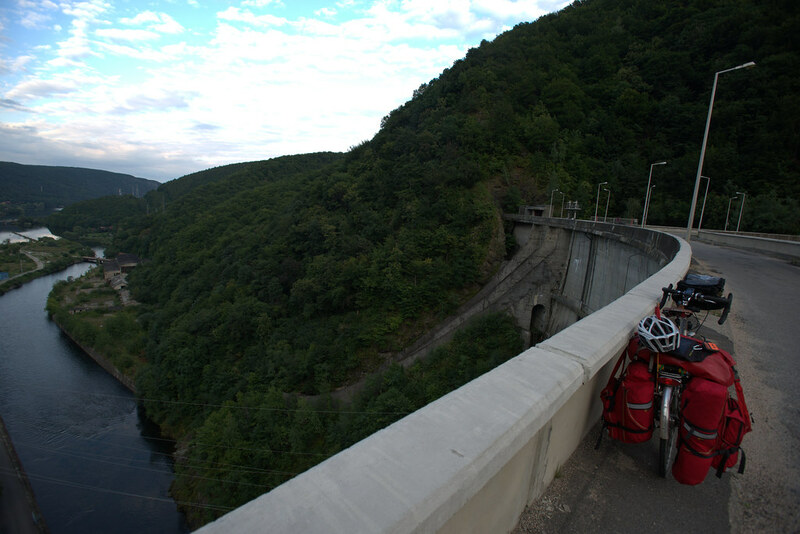 The rest of the descent was more switch backs and we also cycled over this really huge dam before arriving in the first sizeable town we had been in for a while, Curtea de Arges. 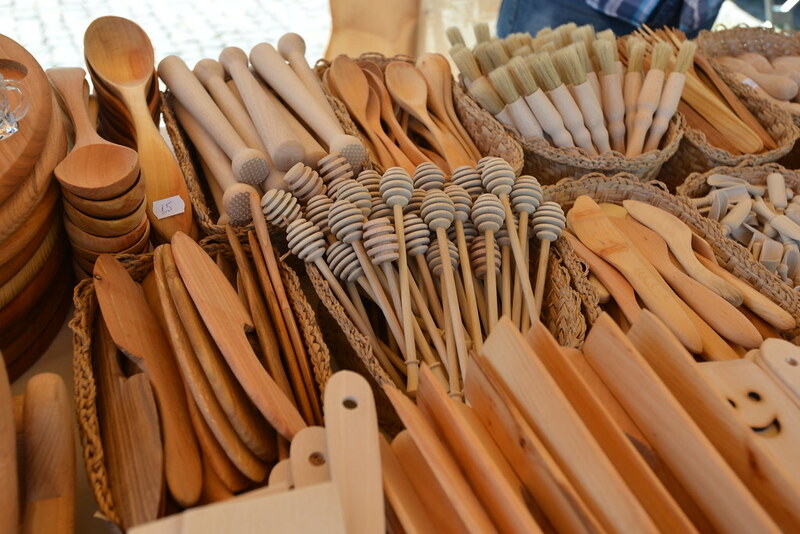 We stopped at a big supermarket to restock our diminishing supplies. 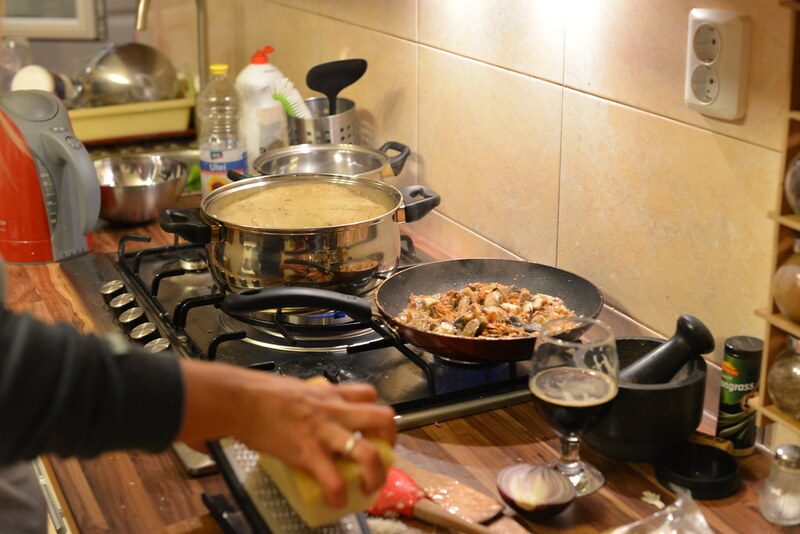 Andre was gone for quite a long time, spent a lot of money and bought a lot of delicious treats but managed to forget the basics including something for that night’s dinner! 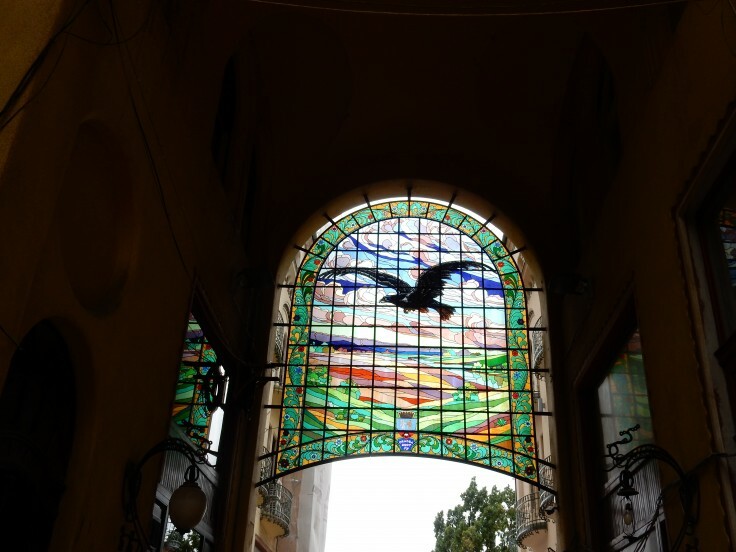 And while he was inside there was a lot of socializing going on outside, a Romanian old guy, a British-Romanian family and then a couple of lovely Polish tourers who we spent a long time talking too! 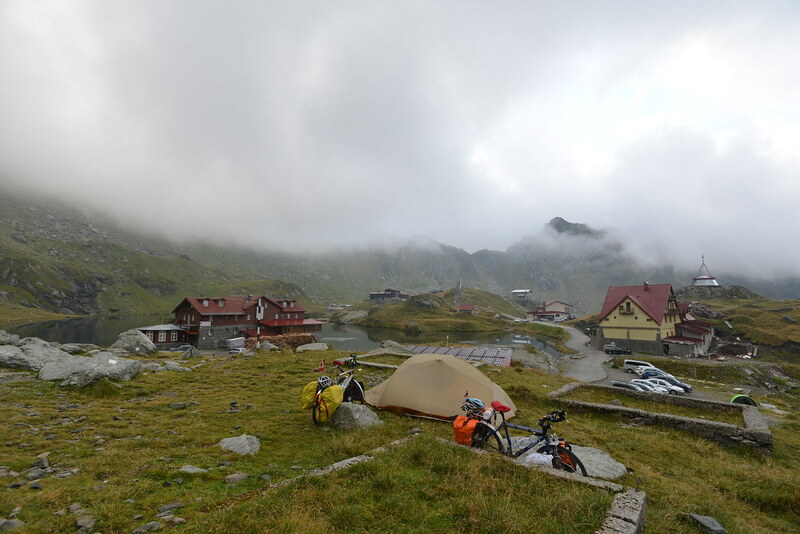 It also started to rain heavily so we sheltered from the rain next to the trolleys and chatted until the weather improved and what was supposed to be a quick stop turned into a mammoth 3 hour break! By the time we said goodbye and left it was late and getting dark. 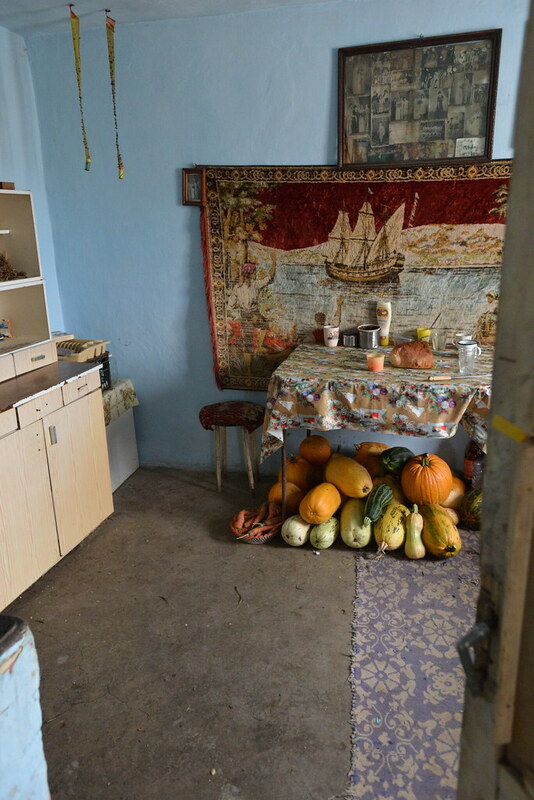 Luckily a very kind lady named Kathy let us sleep in her garden (although she seemed pretty nervous about it), she spoke no English but was with her friends who did and they persuaded her to let us stay. It was a fun evening chatting to all the ladies and we even got a hot shower, which was really great. 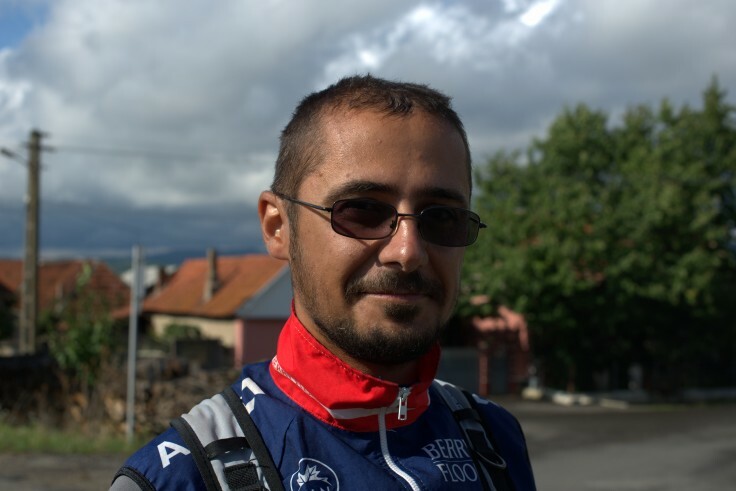 The next few days were fast days, it was slightly down hill and the road was a fairly main one so it was in good condition and direct. 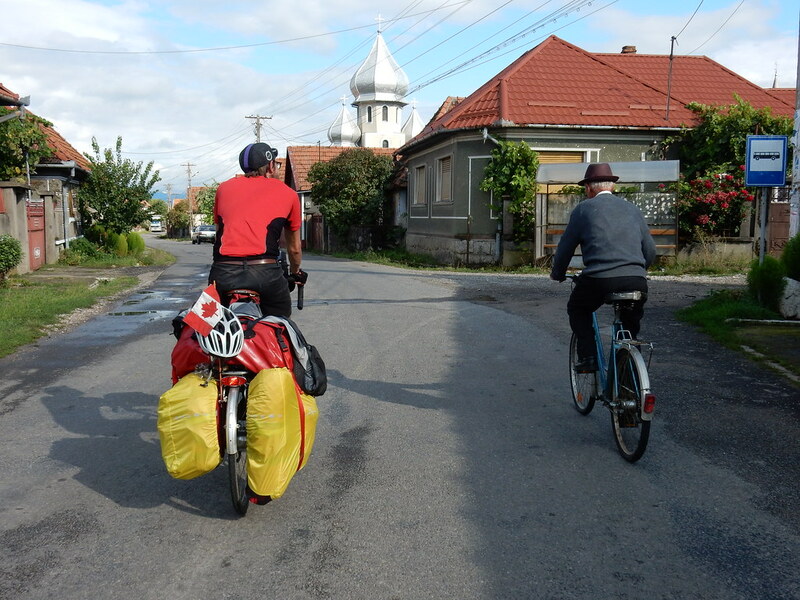 We both missed the mountains as this part of Romania was pretty flat and boring , cycling through town after town. 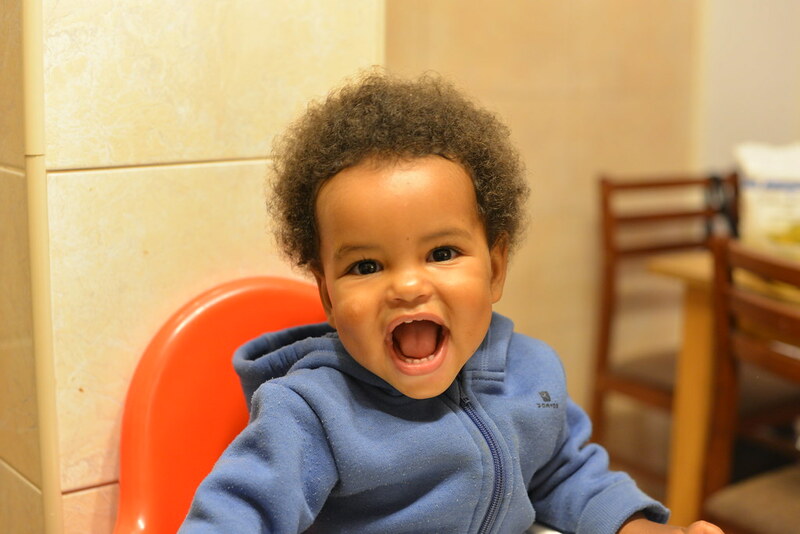 One thing that did liven up our day was bumping into Casey Link! 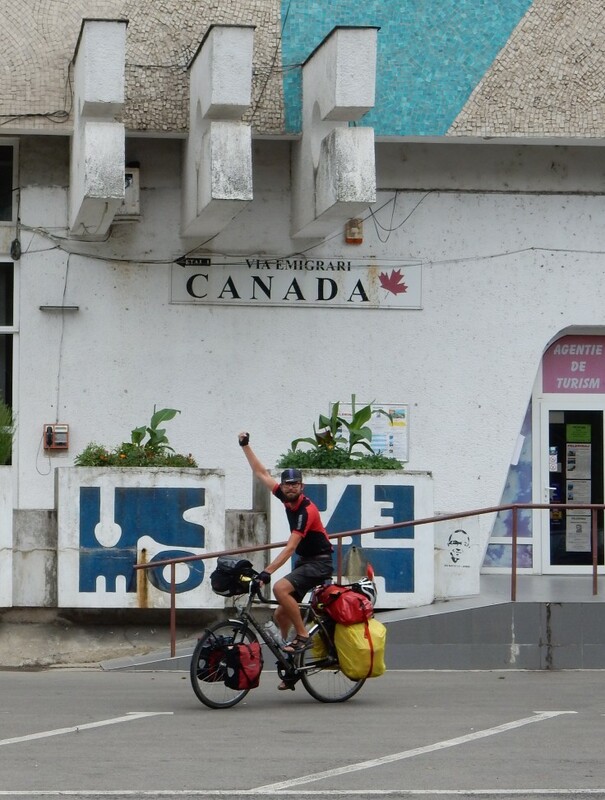 He is a cycle tourer from the USA who has been cycling all over the world for the past 2 and a half years! 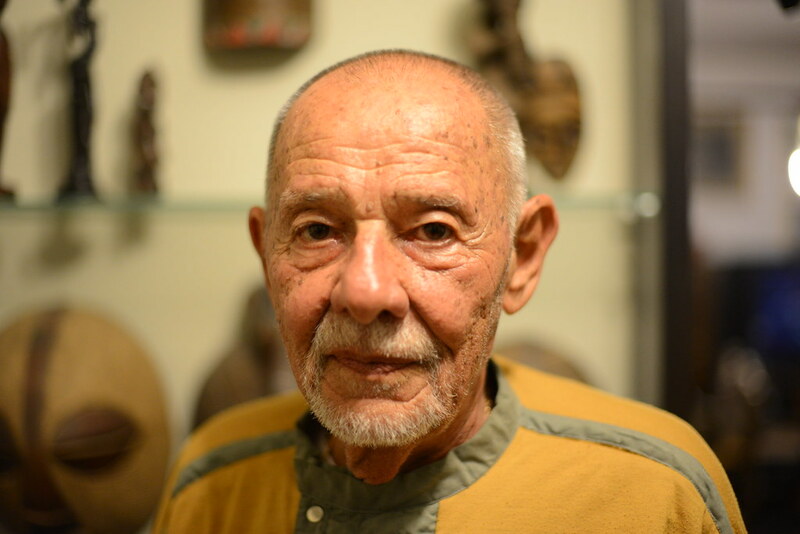 (Check out his blog – HERE) We are beginners compared to this veteran! 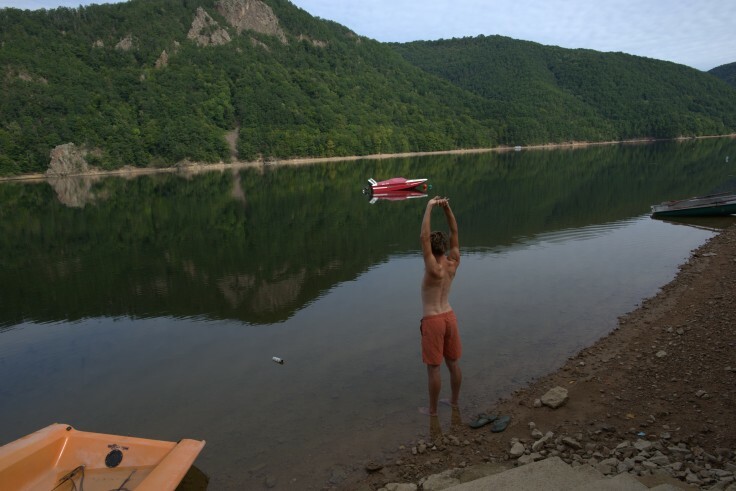 The really crazy/impressive thing about Casey is that he tours with a boat on the back of his bike. That is right you heard be correctly he carries a boat and paddles on his bike so when he hits a river or lake, he just inflates his raft and sticks his bike in it and off he goes! 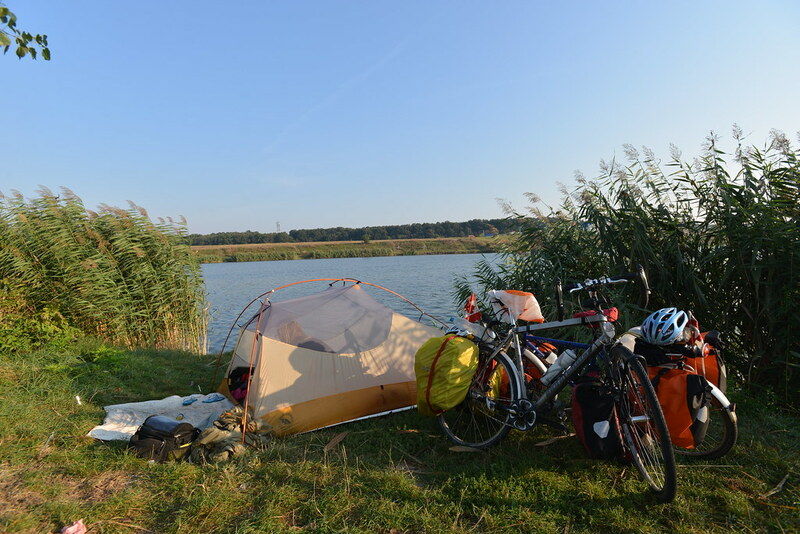 He paddled the entire length of the Danube with his bike in his raft – pretty incredible! 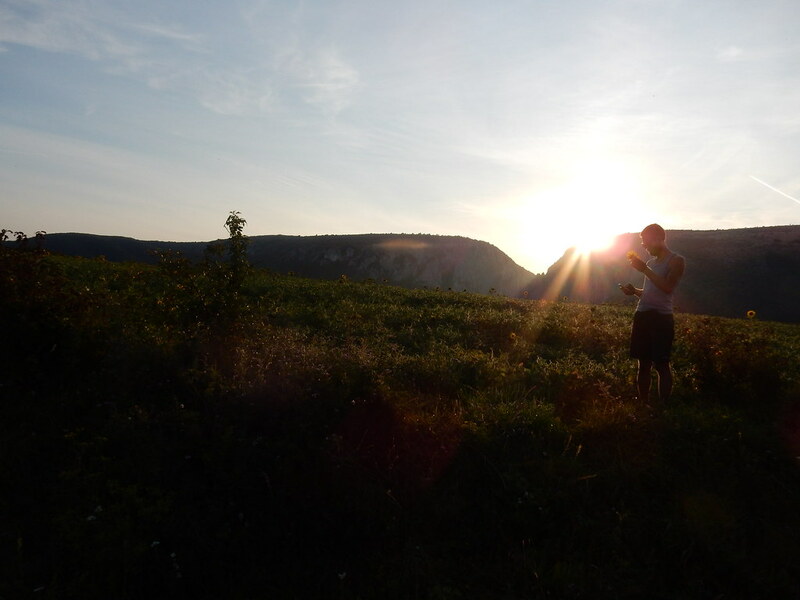 We spent a fun evening in a mosquito-ridden field just off the main road, sharing travel stories, US military rations and beer. 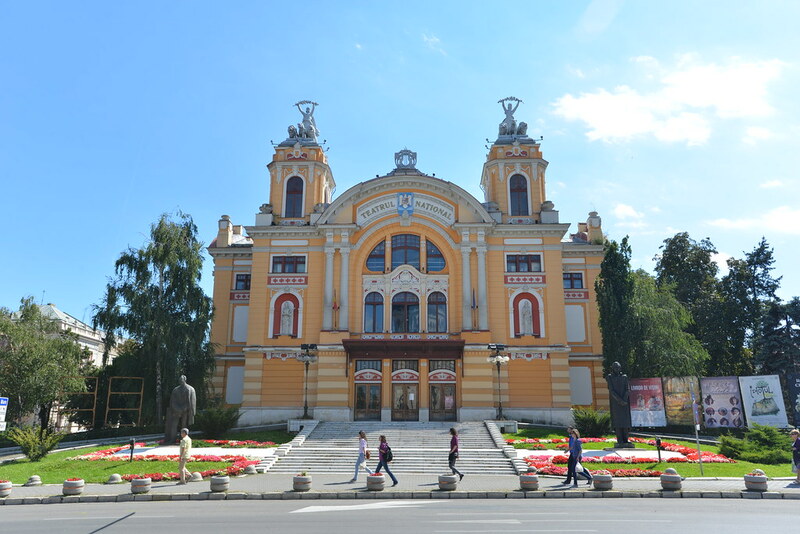 It took us three or four frustrating days to make our way north around Bucharest. 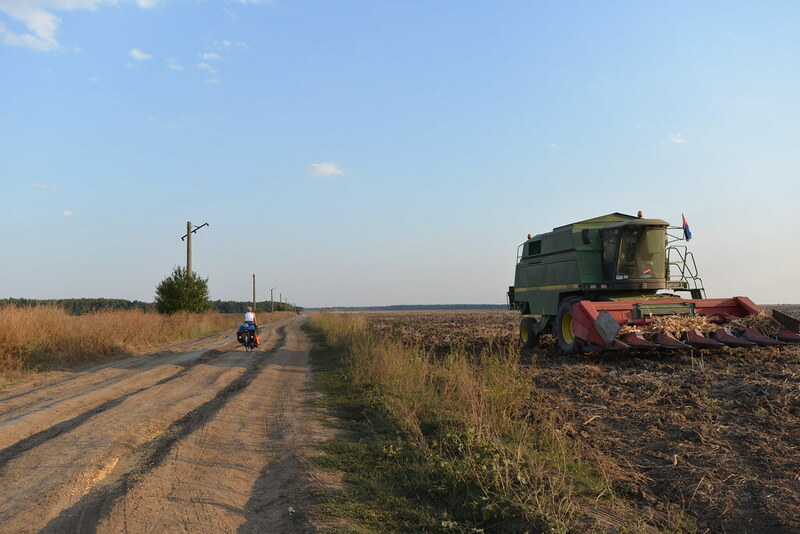 We were ready to leave, as the Southern part of Romania is very flat and agricultural and there is not much of interest to see. It was also very hot and there were no trees for shade, just the tarmac reflecting the heat back up at us. 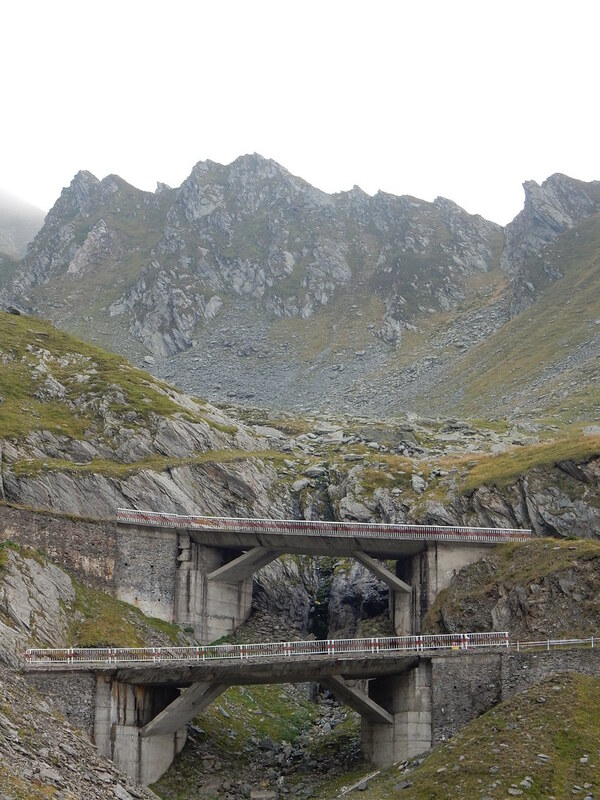 We made a couple of errors in judgment when picking a route which added several days of cycling onto our journey, I guess it is all part of the adventure! 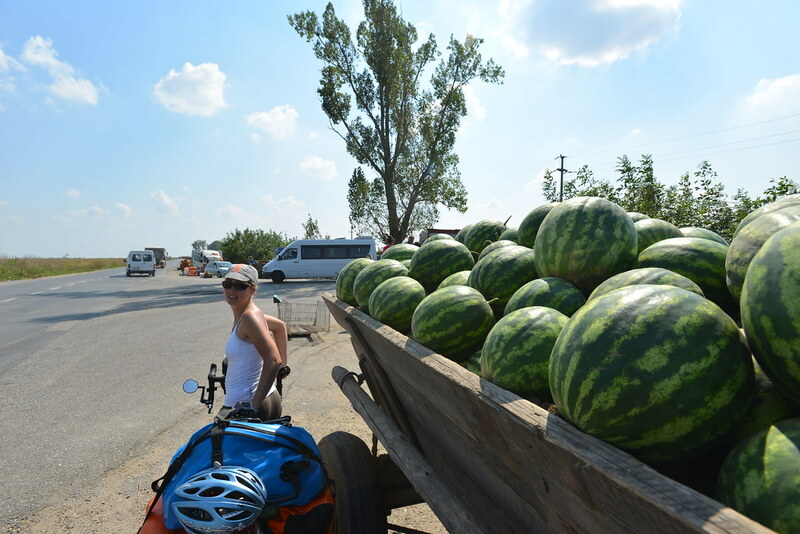 We were given watermelons by kind business men, slept with the fly off the tent for the first time and saw thousands of cannabis plants growing wild all along the roadside! Crazy! One woman seemed to realize what was up as she was ramming her boot/trunk full with the plants. 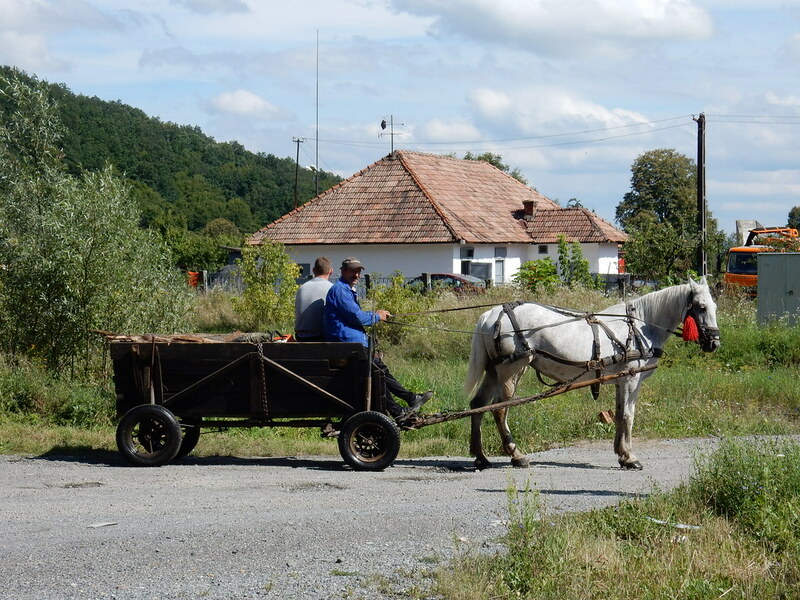 Our last two nights in Romania we met some interesting characters, on the first we had chosen the wrong route and headed south instead of continuing east and the road we ended up on was unpaved, dusty with huge loose rocks which made progress really slow. The road seemed to be the slayer of lorries as we saw two broken down on the road within quick succession. 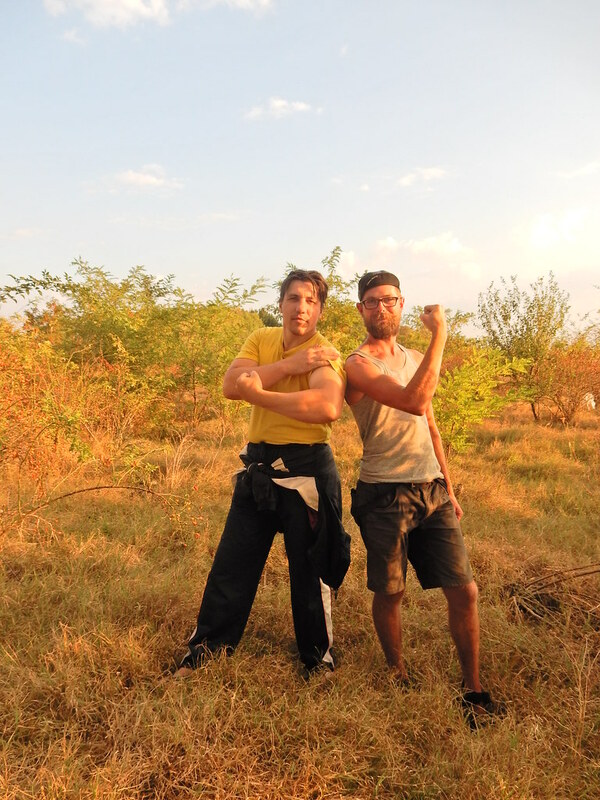 We were soon tired, sweaty and very dusty. 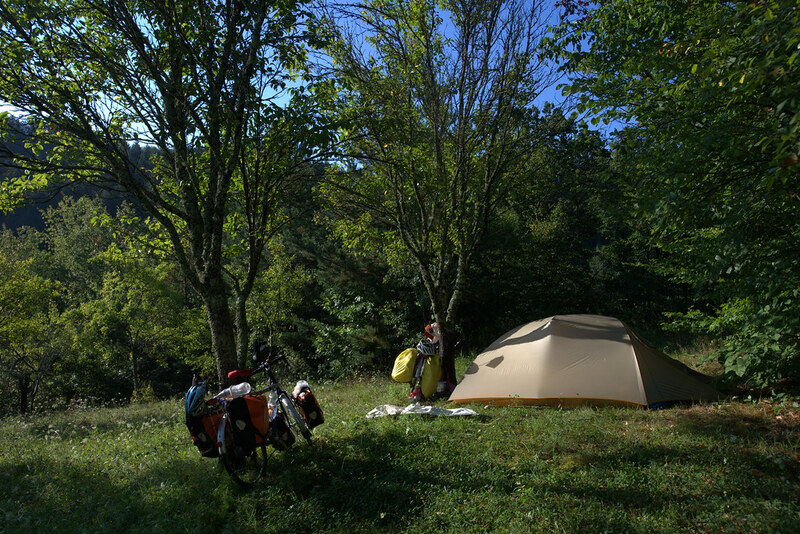 We decided to try and camp on the only patch of land that looked even remotely suitable but it was farmland. So I bravely walked up to a farmhouse that was surrounded by a pack of barking dogs (Andre watched from a safe distance), I was pretty concerned that if the farmer wasn’t there to stop them I would be torn apart by the dogs! Luckily he was there and after a good few minutes of my miming he seemed to understand and agree to let us camp. Later in the evening a crazy (and perhaps slightly drunk) old shepherd came over to say hi. He spent a long while laughing hysterically whilst speaking Romanian at us non-stop, our blank expressions and attempts to explain that we don’t understand him did nothing to deter him! 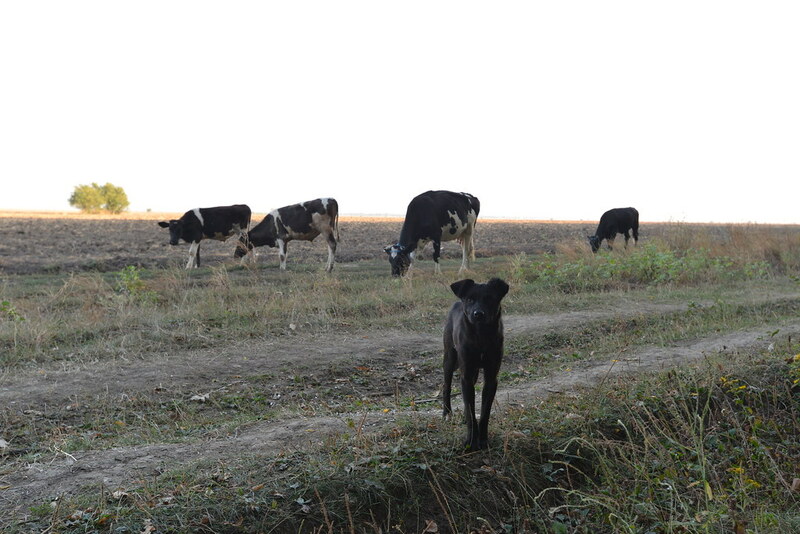 The next morning he returned this time bringing with him a herd of cows and several dogs! 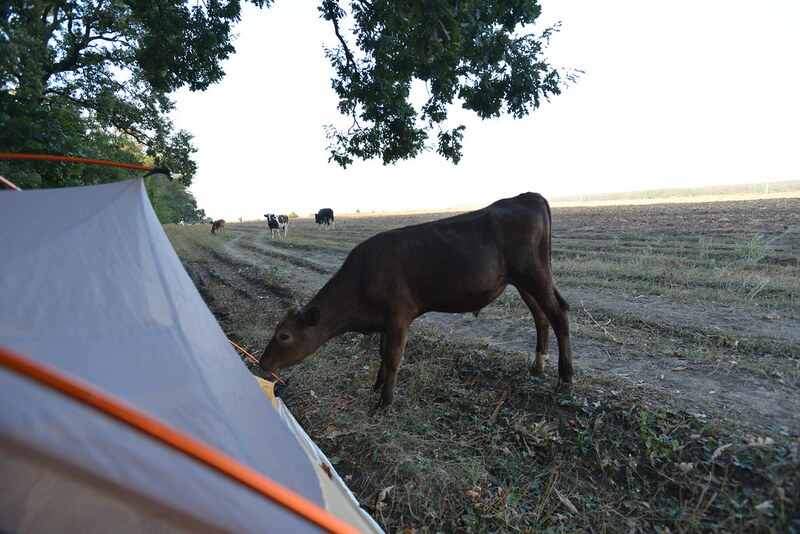 We were awoken to a clatter going on outside as the cows surrounded our tent and one started to lick and then chew on it! The old man started to chatting to us again before moving on with his cows, the cows and dogs were followed by a gaggle of geese that marched past our tent and then a group of pigs! We started to suspect that perhaps there was an exodus all heading for Noah’s Ark and we had camped on their route! After the strange wake up we continued along the horrible road for another 10kms at least before it became paved again. At this point we made another bad decision when picking our route that added at least another days cycle to our journey. 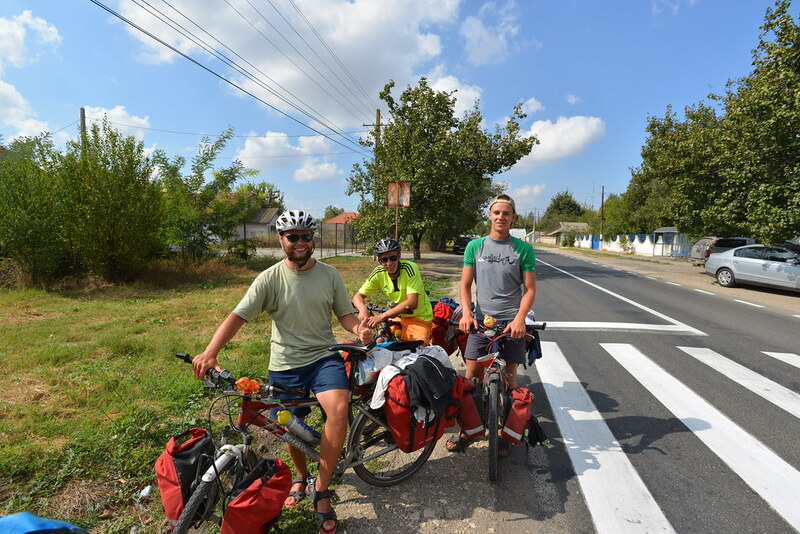 We decided to continue south in the hope that we would pick up the bike route that we were convinced ran along the Danube and then we would follow it from Olenita to Calarasi where we could cross the river by ferry and arrive into Bulgaria. Unfortunately after several hours of cycling we reached Olenita and searched high and low for the bike route only to discover that it doesn’t exist on the Romanian side of the Danube and only runs along the Bulgarian side and there was no road at all along the river in our direction so we had to cycle back to pick up the highway – it was disappointing and a big waste of time! 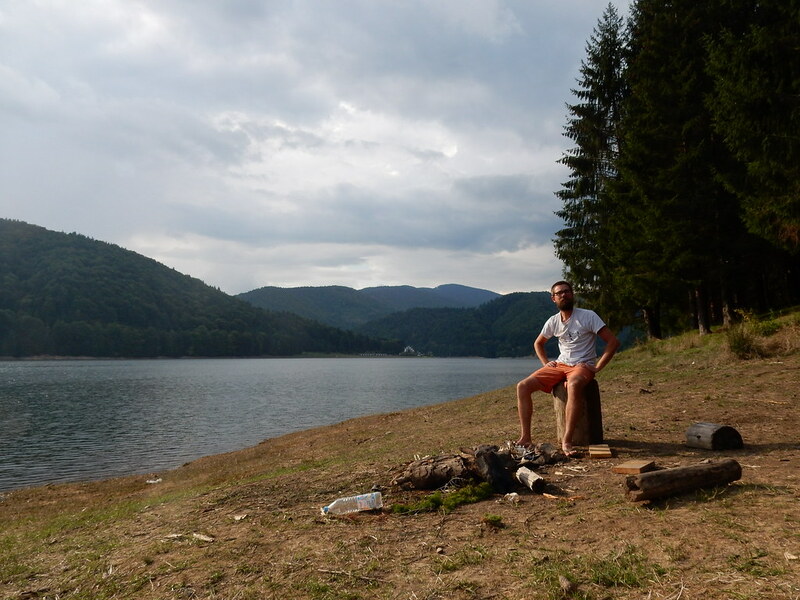 On our last night in Romania we camped on a man-made lake which was a pretty nice spot and as we were setting up the tent a huge Romanian guy called Stelios arrived to make friends with us, he was built like a brick wall and incredibly tall too, so we nicknamed him Andre the Giant! He asked us if we would like some coca cola to which we replied sure and then he disappeared off on his moped for 30 mins or so before returning with a large carrier bag full of shopping for us! He brought sausages, chocolate, coke, watermelon and all kinds of other things it was very kind. He seemed curious and keen to hang around and chat for the evening but didn’t want to join us when we ate which felt a little uncomfortable for a bit as he was just watching us eat and go about our normal evening! He was friendly though and we had a fun evening even despite the communication issues! The next morning we were awoken to the sound of the moped and as we suspected he had returned to hang out! 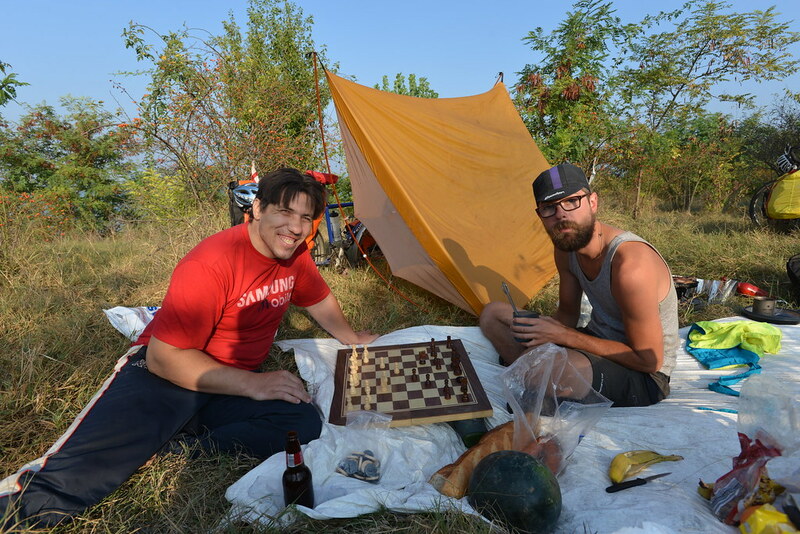 This time he brought breakfast, beer and a chess board! We declined the beer as it was a little early even for us but Andre did play two games of chess with him and got beaten both times! 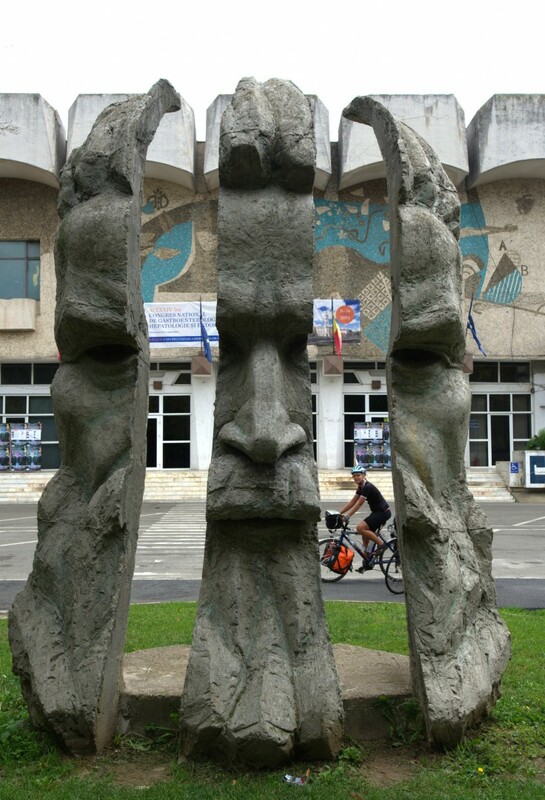 We had hoped for an early start this morning as we desperately wanted to make it into Bulgaria, however instead it was an unexpectedly interesting and fun morning instead and I think Andre the Giant was happy to hang out. 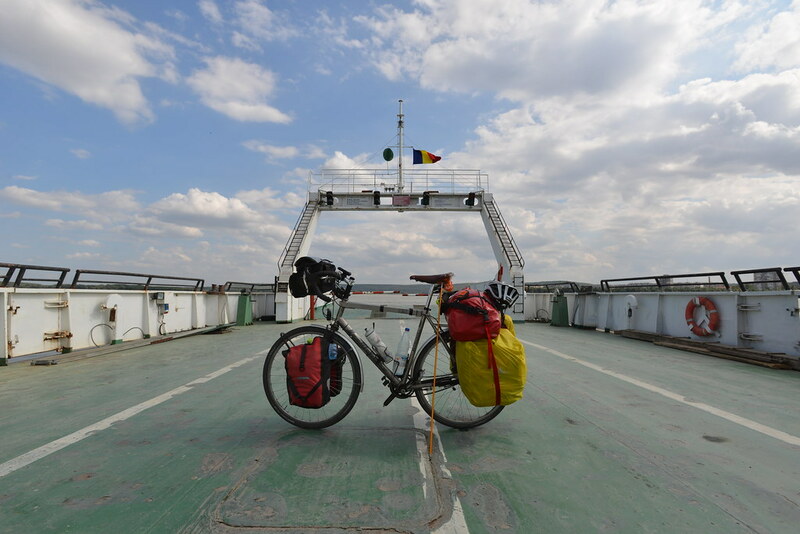 After saying goodbye we left and spent the morning cycling to Calarasi where we boarded a little ferry and crossed the Danube into Bulgaria – finally! 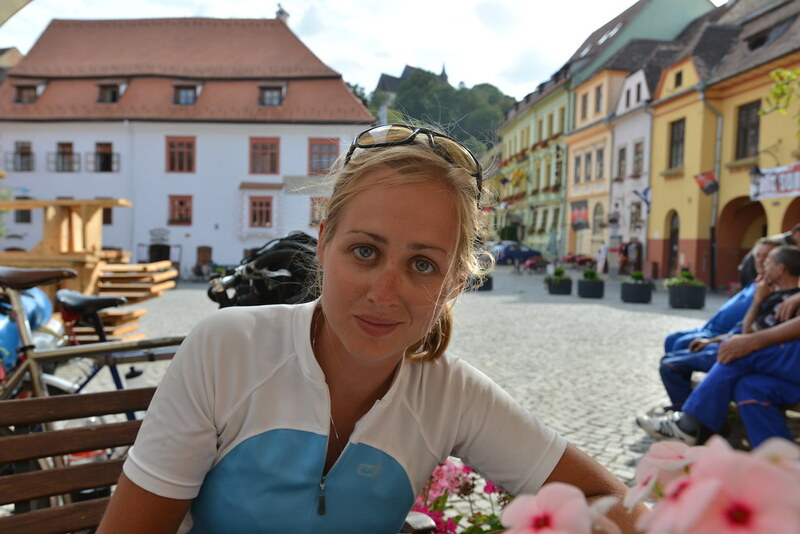 We both loved cycling through this wild and beautiful country and what made it so fantastic was the kindness and warmth of the Romanian people. We are sad to leave but we hope to visit again in the future, there is so much more to see, and we barely scratched the surface. 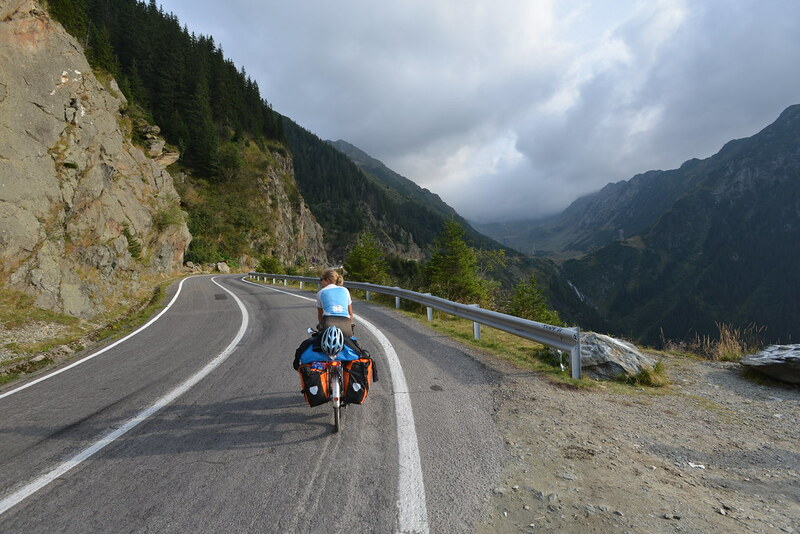 Check out our next leg of the journey as we cycle through Bulgaria.